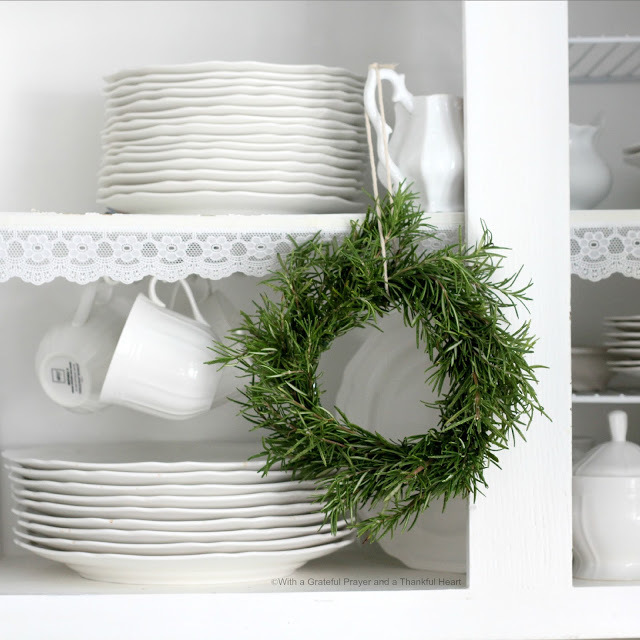 Do you make a plan and then arrange when decorating? Or are you more like me and get a sudden burst of inspiration and change things around. 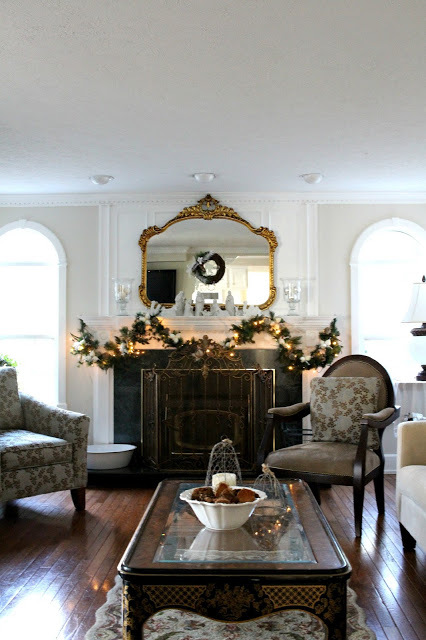 This mirror had been happily hanging on the upstairs hallway wall and without warning, I wondered how it would look above the fireplace mantle. 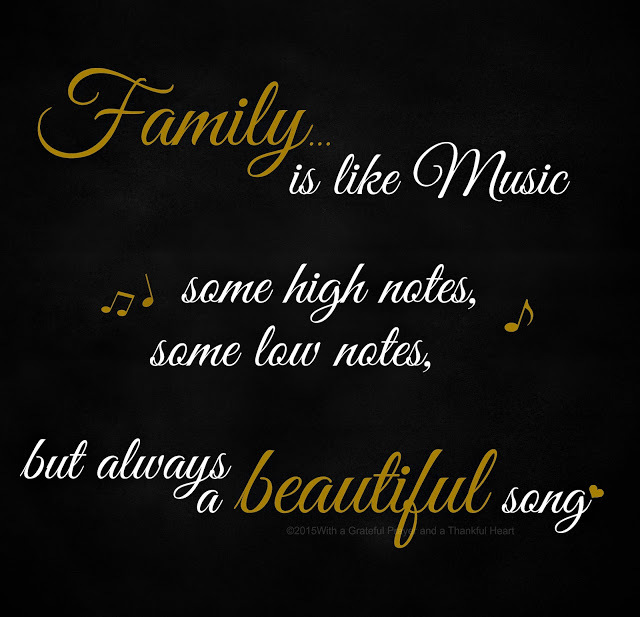 I like this quote. I think there is some wisdom in these words. What I do not like is heights. But when I got an estimate for a painting job that was higher (ha, that could be a pun) than I was willing to pay, I looked for alternatives. I peeked into Abbey’s room while she was working on an assignment for her digital animation class and found it very interesting to watch her progress. 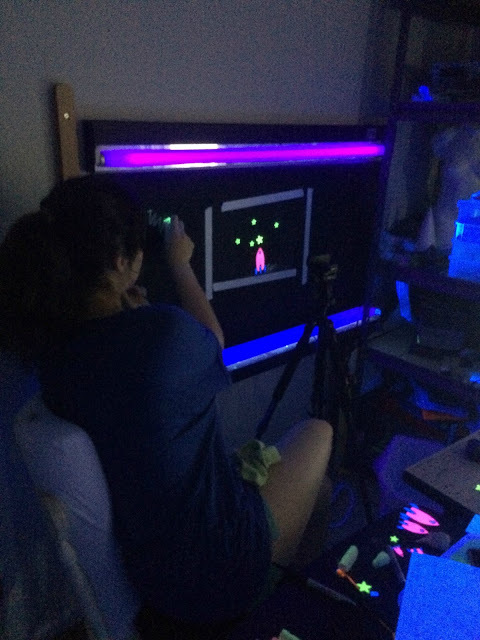 Yes, she has two black lights and a blackboard bolted to the wall, black-out coverings on her windows and only about 3-feet of empty floor space in her bedroom with way too much stuff bursting out everywhere. 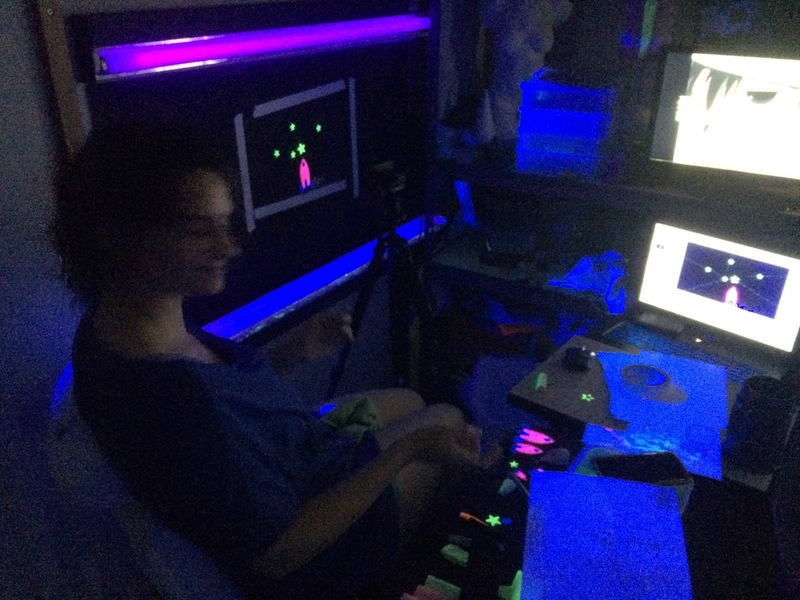 but, she loves what she’s doing! 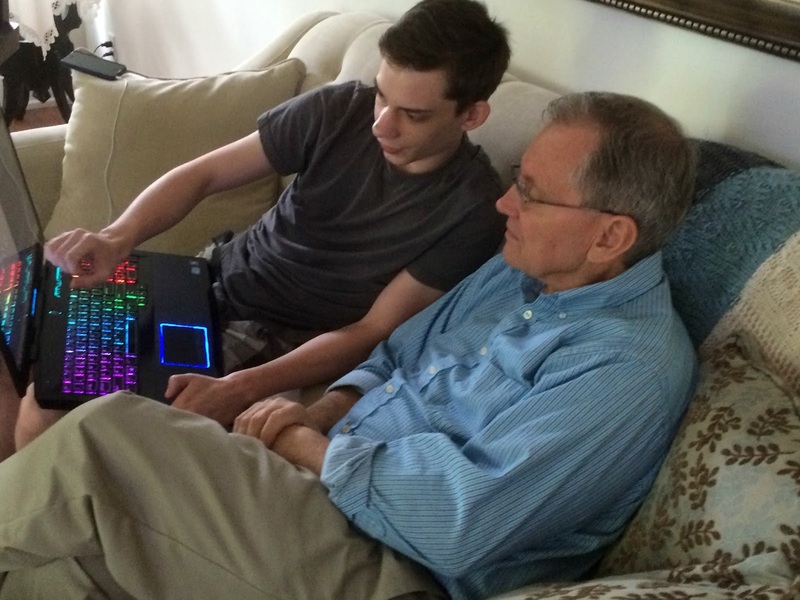 Jared enthusiastically shows John each step completed as he creates a computer game. 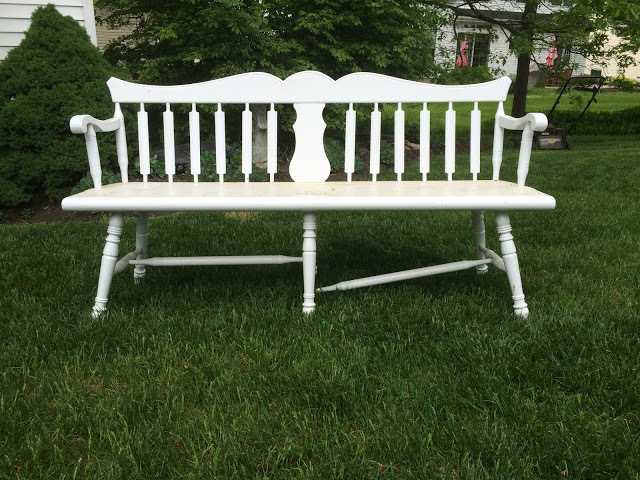 My favorite $3.00 bench purchased from a garage sale 25 years ago and painted and repaired dozens of times got to the point that John just couldn’t fix it and keep it fixed. Mostly it was the arms that took the brunt of the abuse but even the legs were not staying together any longer. We considered making a porch swing from the bench but I really wanted it back in the kitchen to hold all of those little grandchildren. 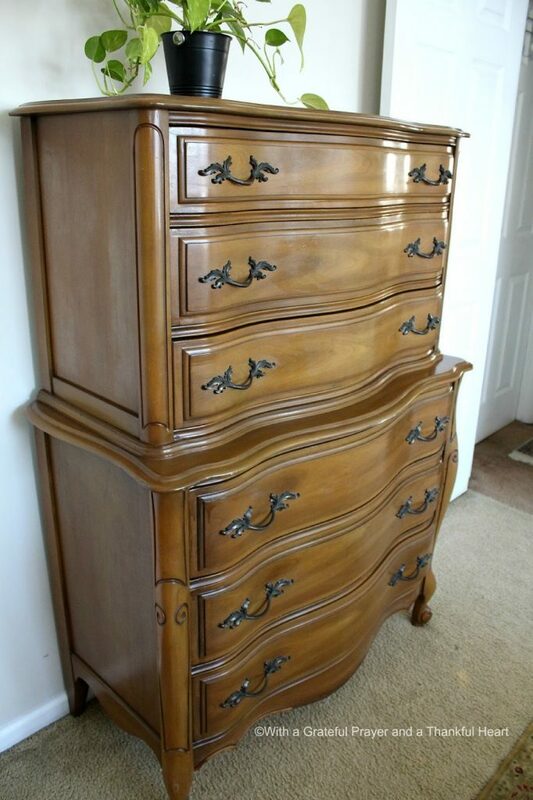 So we sent it off to a furniture maker for a complete overhaul . Please, please, little bench, stay strong! 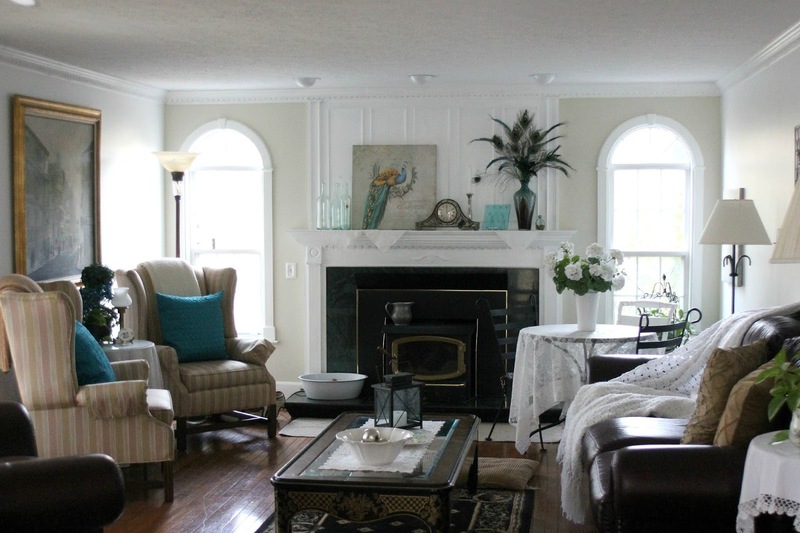 We have been moving furniture, boxes and rearranging rooms as Erin and Jared return home. 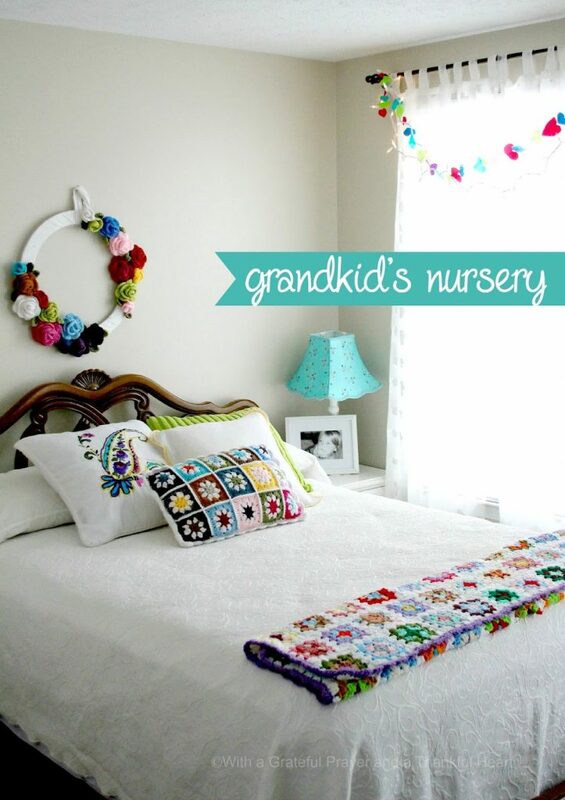 The nursery has become Jared’s room and the guest room is now Erin’s room. Making them feel loved and comfortable, and though sad about the circumstances, we love having them home. 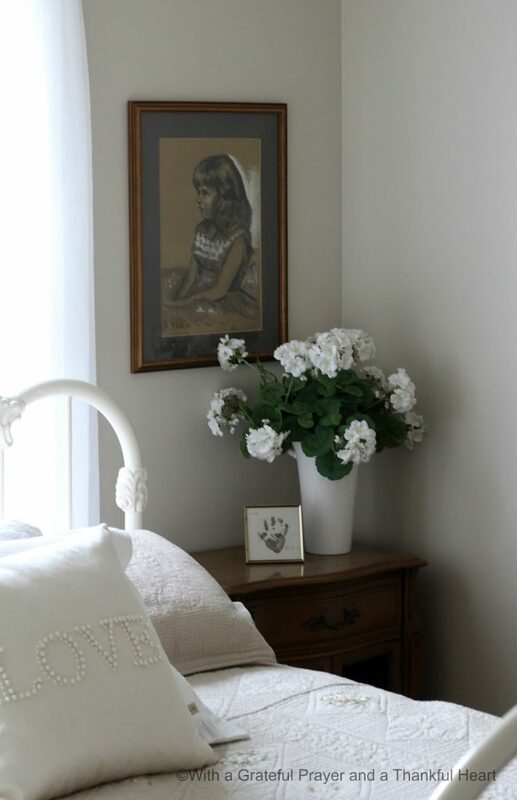 The painting above Jared’s bed was something my sister gave me when she moved out of her house last fall. I wish I had taken a photo of the before when it was in shades of bright green. I knew when I saw it I would paint over the canvas. Wanting something masculine for this room, I went to work. Nothing artistic but it works to fill a big blank wall. 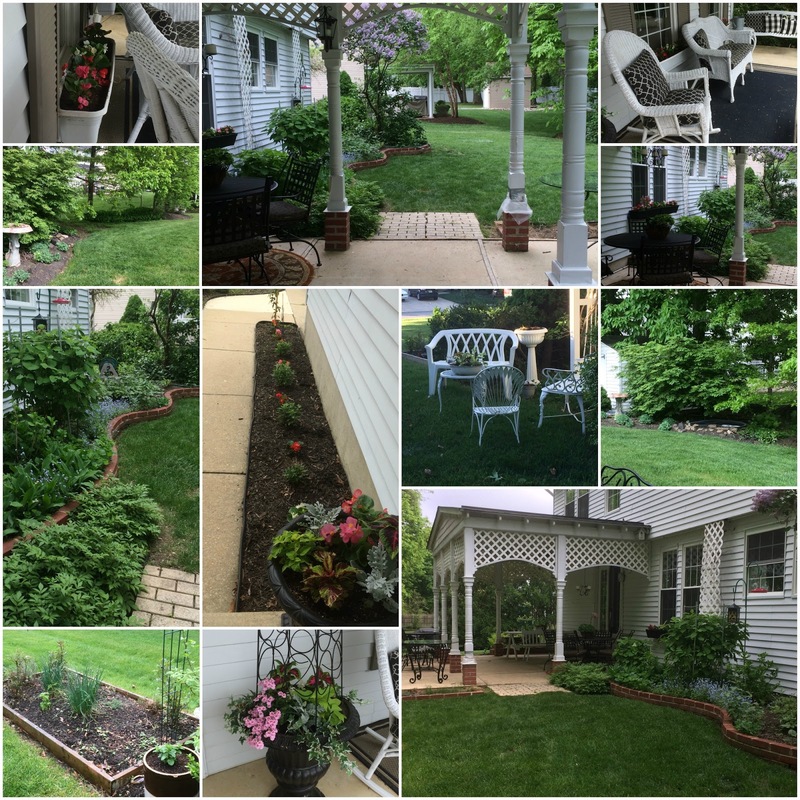 We’ve done lots of yard work and home repairs. 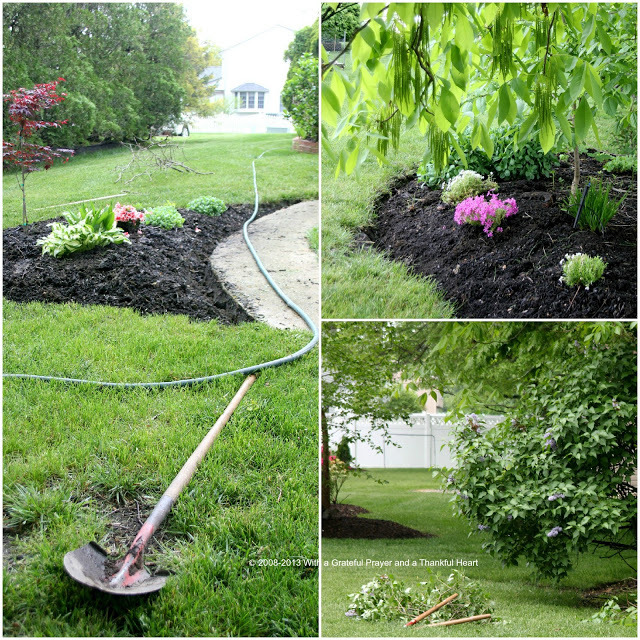 Weeding, planting, painting, edging, raking, digging, dividing, potting, sweeping, blowing, washing and, well, you know. 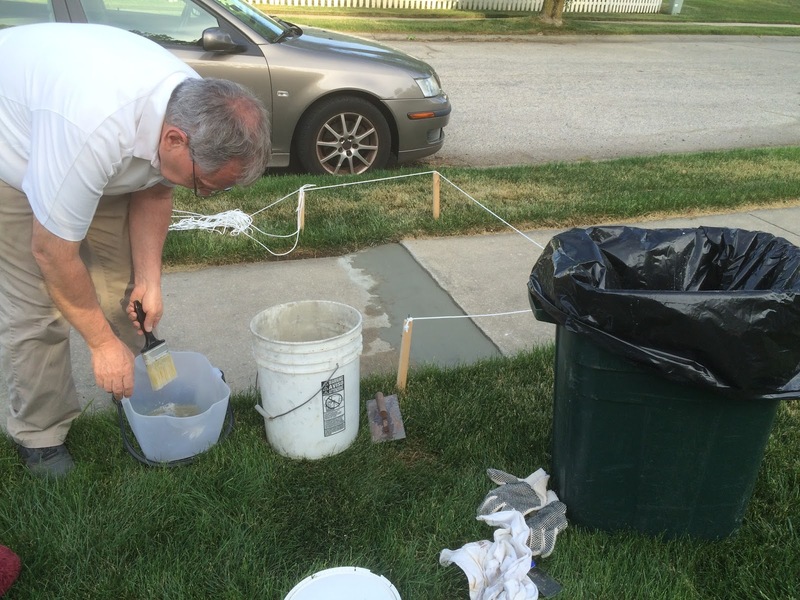 You are probably doing the same things at your house. Who would had thought removing 20-year old, dead boxwood bushes would be so hard! Eighteen in all. The last five with some much appreciated help from Jared. Always the sentry, Raider keeps watch while we work. Now, it hasn’t been all work. 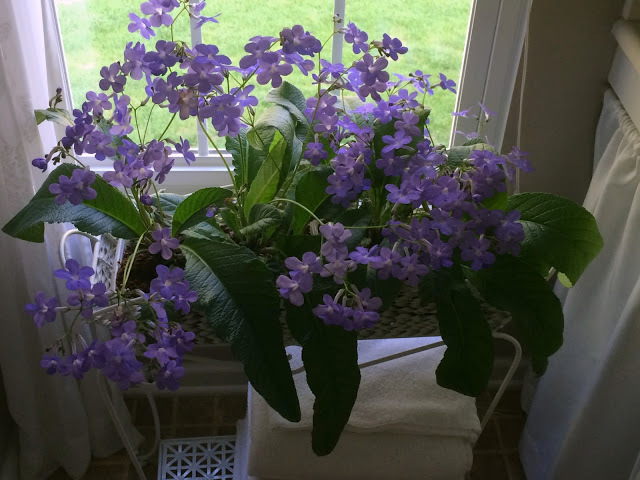 My streptocarpus is blooming profusely in our bathroom. Our favorite time to visit Brigadier General William C. Doyle Memorial Cemetery is Memorial Day weekend when all of the graves are decorated with an American flag. Both my parents are interred here. A perfect place to find a bench, remember loved ones and the Veterans that gave their service for our freedom. 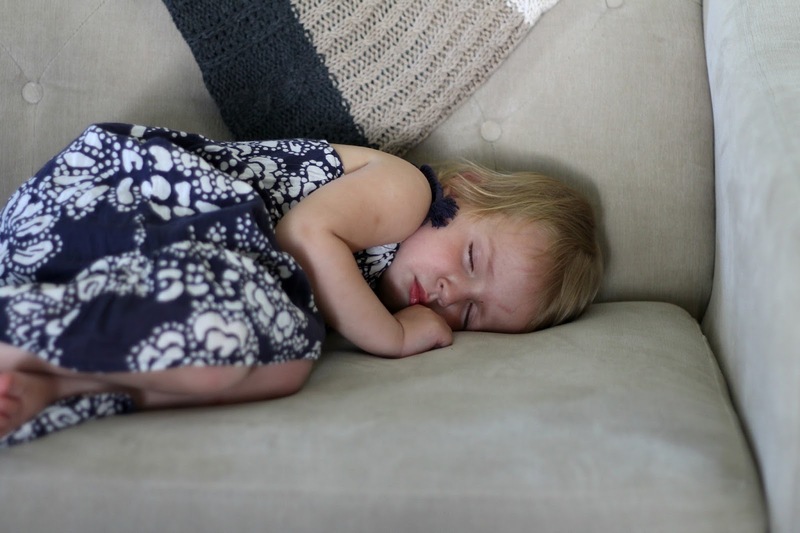 Haven’t had much time with the littles through all of these changes but John snapped this pic of Chloe sleeping soundly the last time she was over. Playing it tiring work! 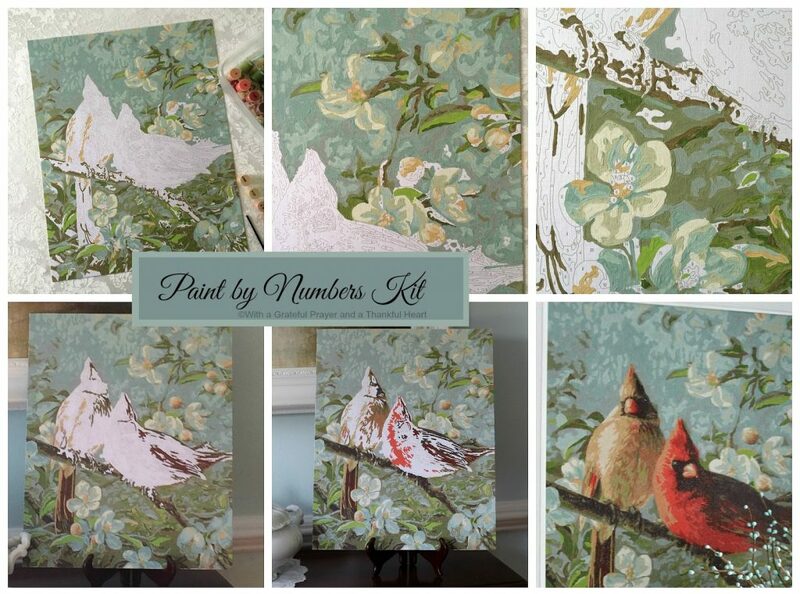 Paint-by-number kits… do you remember them? Have you completed one? 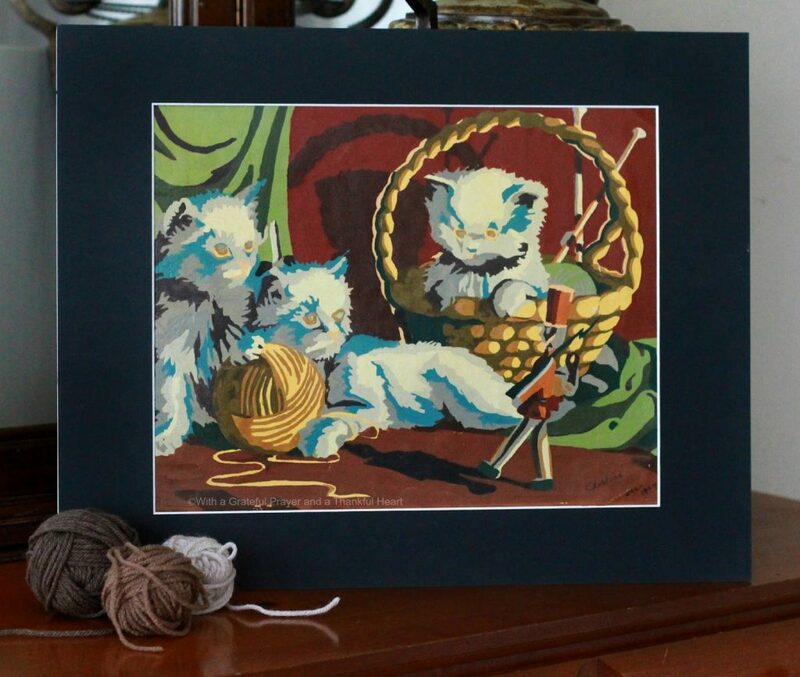 This Playful Kittens piece was painted by my mom in 1954 and truly a piece of Americana. The oil colors are still vibrant and bright. I stood it behind both a gold frame and a black mat to see how it would look. 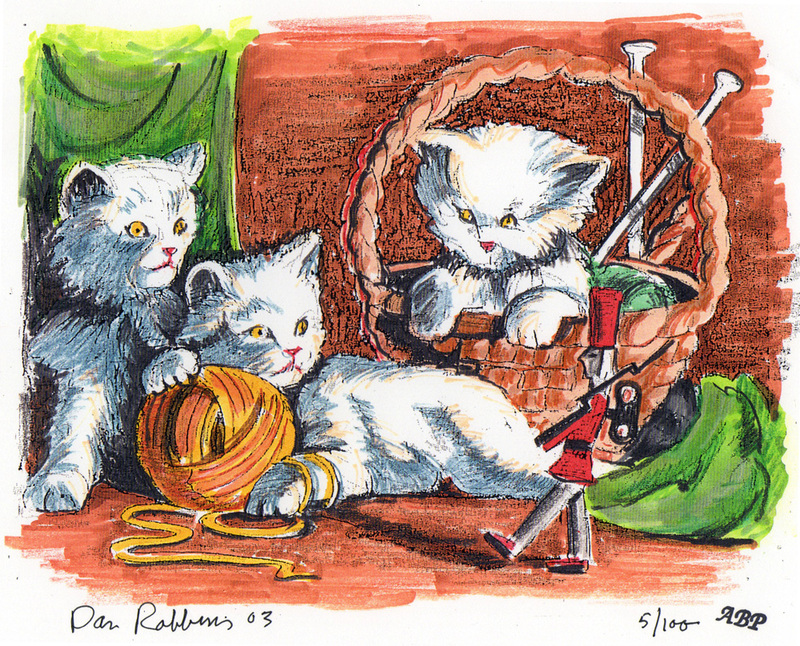 (Photo source Paint by Number Museum) Here is the artist, Dan Robbins, sketch of Playful Kittens. There is an interest in collecting vintage paint by number (PBN) paintings and kits are still available and popular today.In 2001-2002, The Smithsonian American History Museum had an exhibit highlighting the paint-by-number fad in America beginning in the early 1950’s by engineer and owner of the Palmer Paint Co., Max S. Klein and designer, Dan Robbins. Though art critics denounced this craze, millions of people as well as celebrities were fond of these kits. The Eisenhower Presidential Library included pieces completed by Nelson Rockefeller and J. Edgar Hoover. 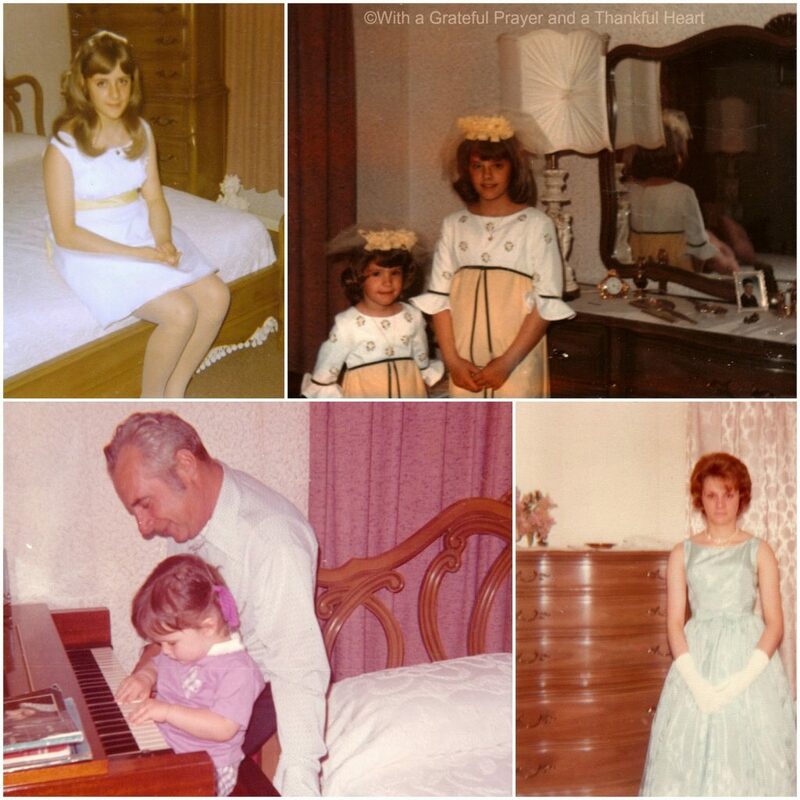 I gathered the photos for the collage above from the internet because they are paintings I remember both my mom and aunt completing and displaying in their homes. I looked forward to moments I was able to sit at the table and allow the thoughts and concerns of the day to disappear as I applied color and watched as the scene slowly came alive. Sometimes I would choose a different color or blend two colors together using the lines and directions as just a guide. And, yes, it is framed and displayed on a wall in our home. In 2008, a private collector in Massachusetts assembled over 6,000 paint by number works dating back to the 1950s from eBay and other American collectors to create the Paint By Number Museum, the world’s largest online archive of paint by number works. 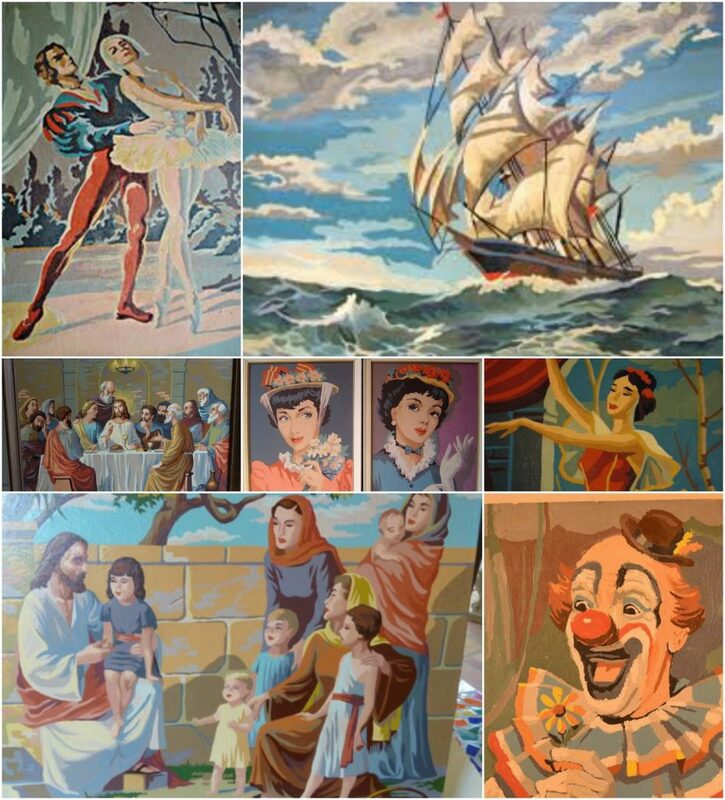 Whether or not paint by number kits curtail an appreciation of art or the skill and talent of creating individual pieces, there remains an enthusiasm and joy in the hobby as well as a desire by many to collect completed paintings. 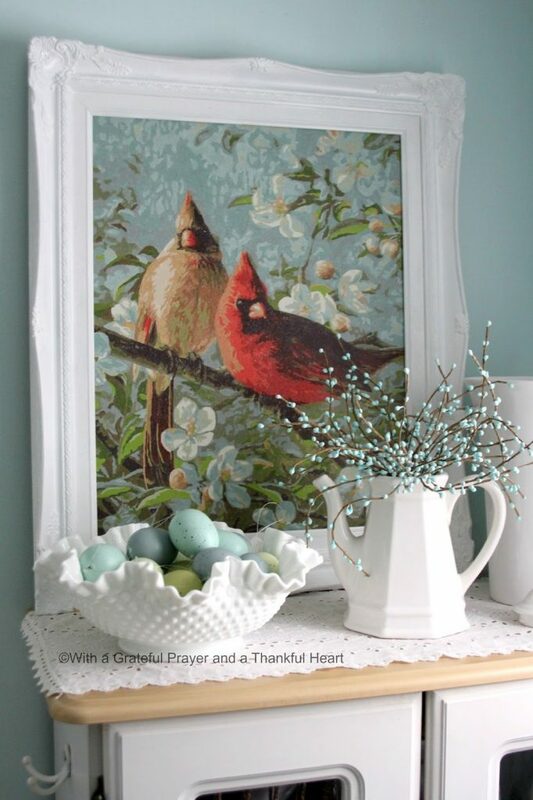 Over the years, they have brought enjoyment to hobbyist and when completed, proudly hung in homes with a sense of accomplishment. By the way… I have just ordered my second kit as I join millions of other Paint-by-number fans! 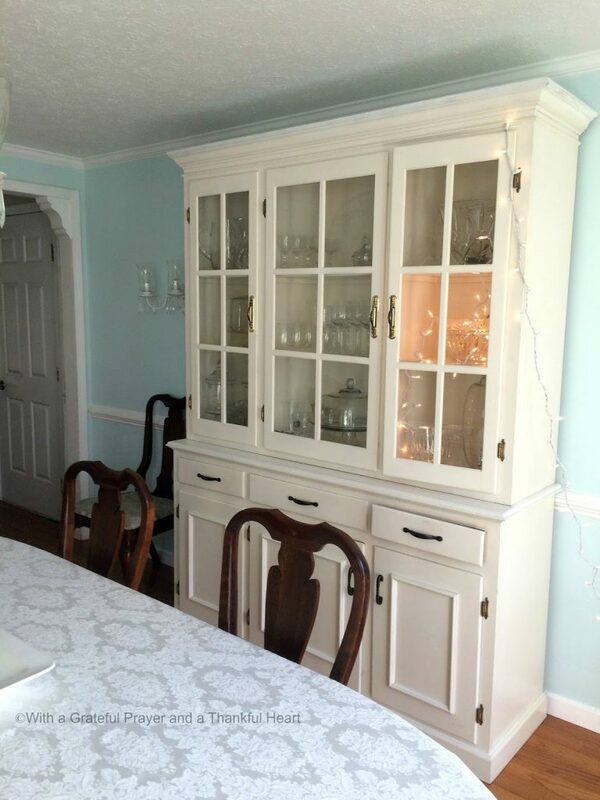 I cannot tell you how excited I am about this beautiful hutch from my sister! When she asked me if I wanted it I could not believe her generosity. Not only is it white, but it is big and deep. And able to hold many of my larger pieces that I did not have easy access. This is the view from the kitchen. John and I moved the hutch that was in that space to the opposite wall. 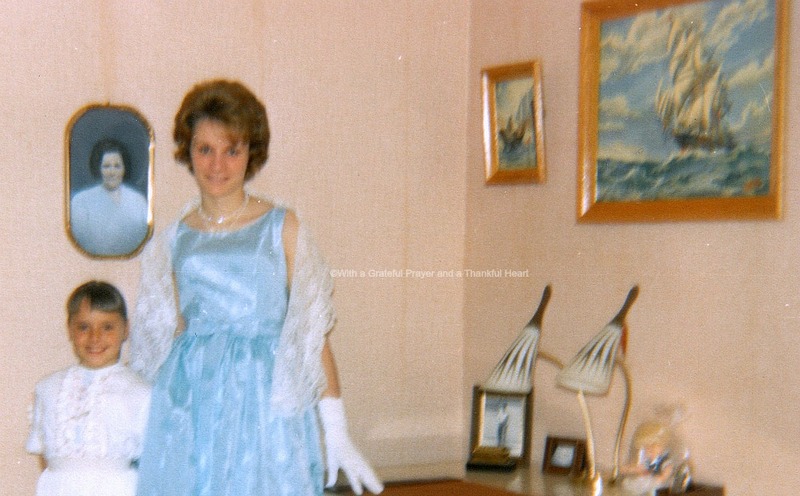 Carol used the top and bottom of the hutch in different rooms. The top section was on the floor as a book cabinet and she didn’t light it up. “It’ll be fine,” he said. Yep, not only did he blow all of the bulbs along the inside edge of the cabinet but many of the bulbs shattered throughout the cabinet. 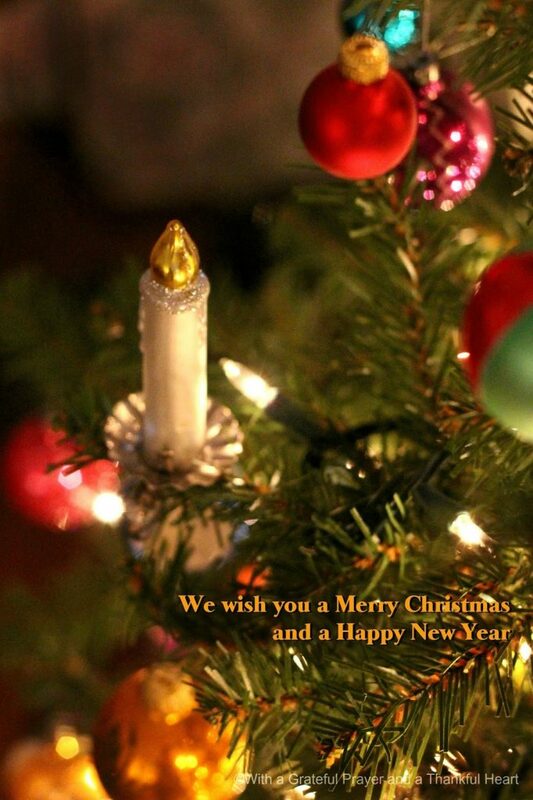 Now its off to a lighting store to find replacements. 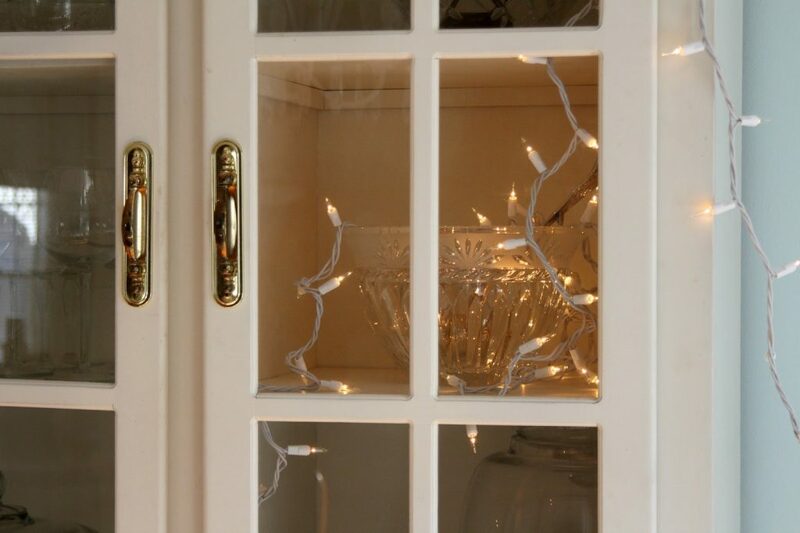 The little twinkle lights strand was just so I could get an idea how the crystal pieces will look when there is illumination from working lights inside. 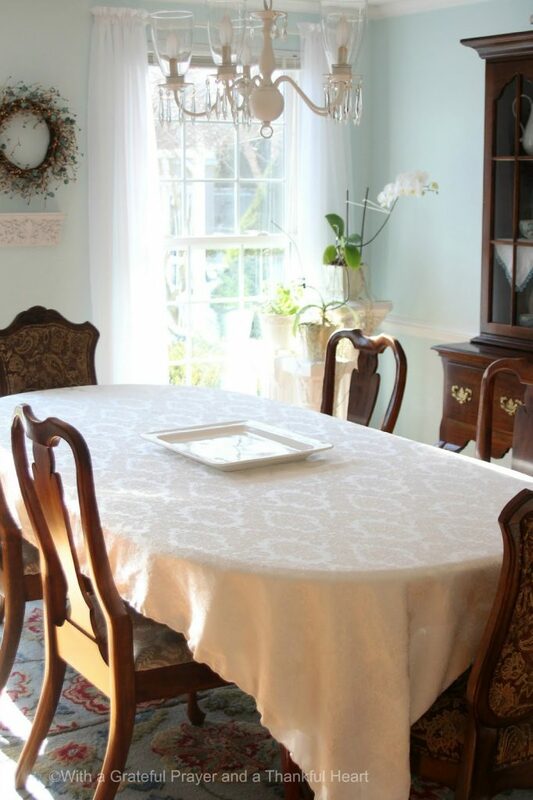 Carols also gave me a pair of rugs that are the perfect color and pattern for the dining room. Though too small for the area, I am determined to make them work. 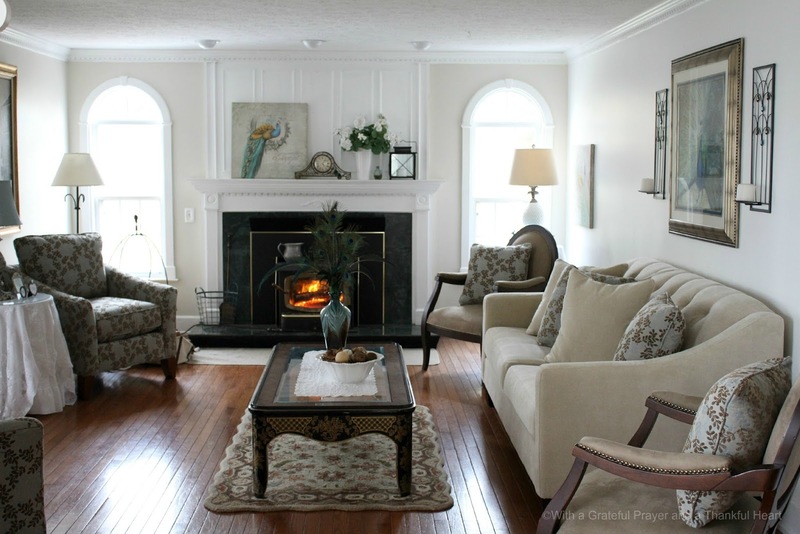 Since this photo was taken, we have added a backing and taped the two rugs together on the bottom so they appear as one. 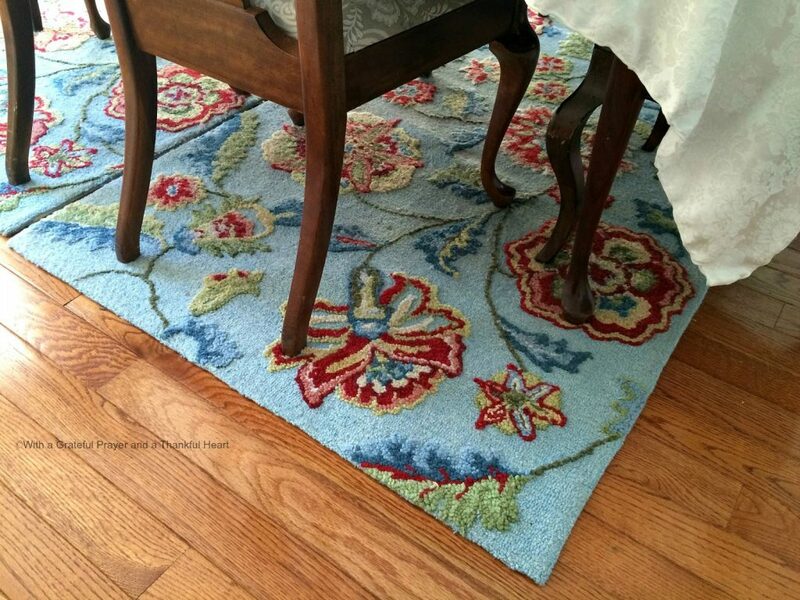 The chairs do not remain on the rugs when pulled out for sitting but, I can live with that because it looks so pretty! 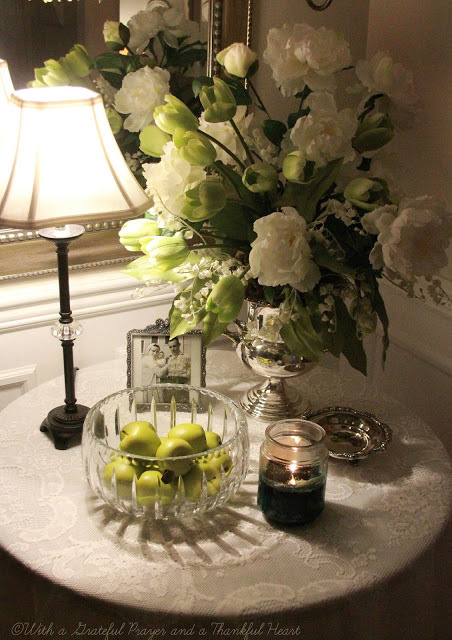 It is a mix of vintage, garage sale and whimsy. 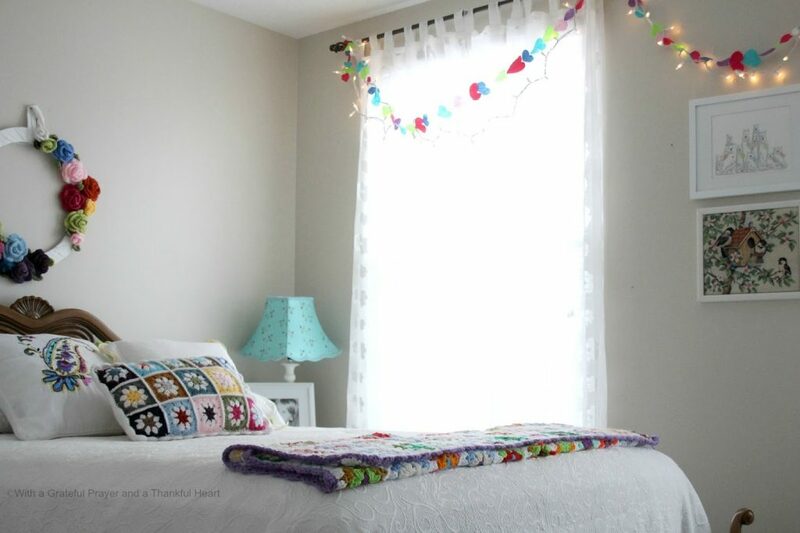 A room where cousins sleep and little ones head to as soon as they arrive. 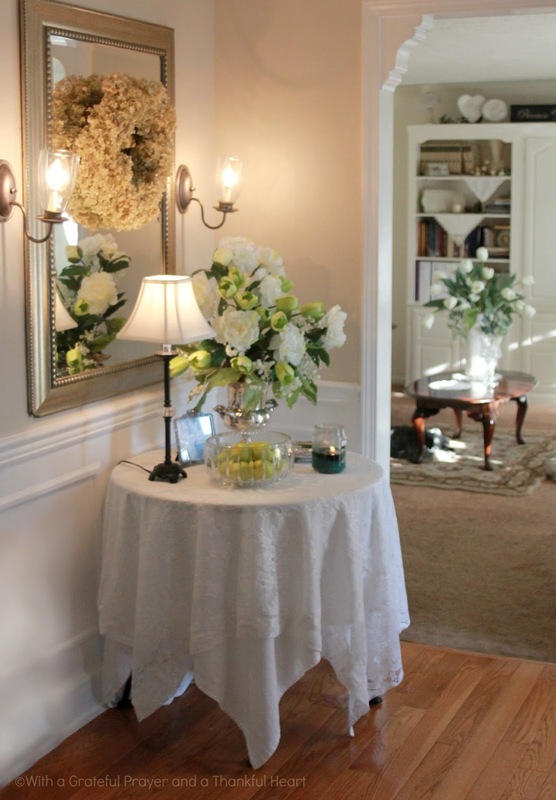 When Abbey outgrew the cradle by our bed, she moved to this room with both a door to the hallway and a door to the master bedroom. The crib was later exchanged for a toddler bed and a giant Barney poster hung on the wall. 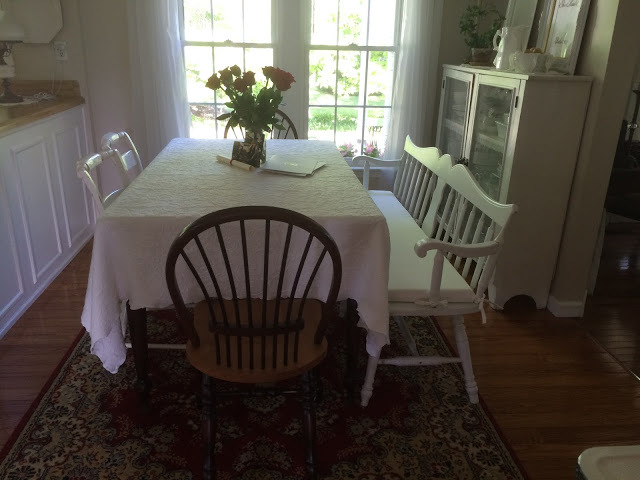 A crib remained for many years as I provided child care in my home and grandbabies came along. A few years ago, the crib was changed to a queen size bed. 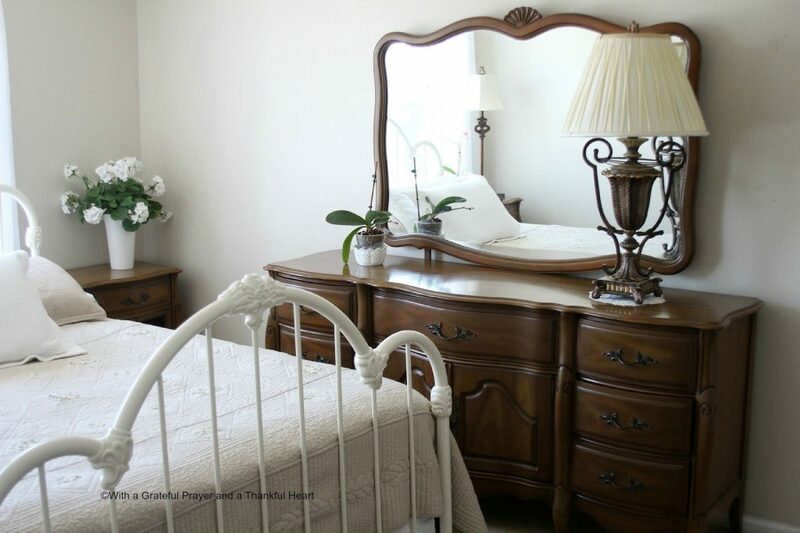 Now, it is where the bed from my parents vintage French Provincial bedroom set fits in best. I can just imagine how happy it would make mommy knowing her great-grandchildren are snug and warm beneath the covers on her bed. 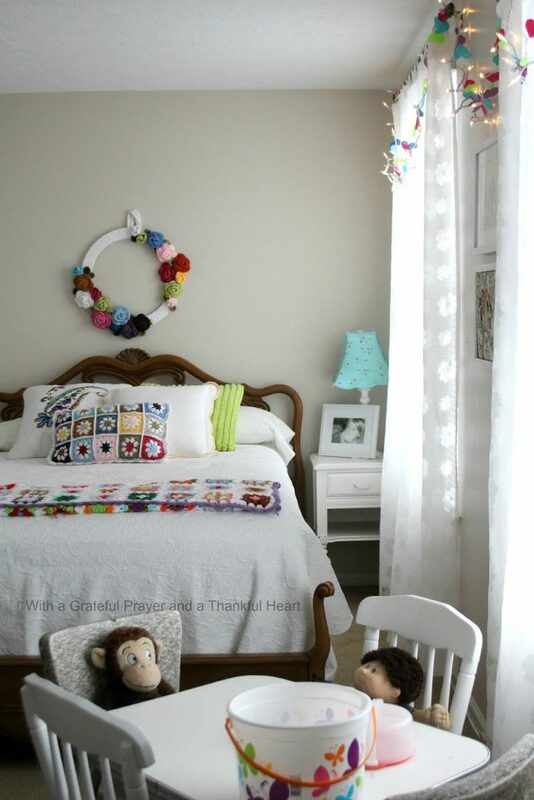 This full size bed allows for a little extra play space while entertaining doll babies and monkeys. John’s Aunt Marie made the crochet lap blanket. 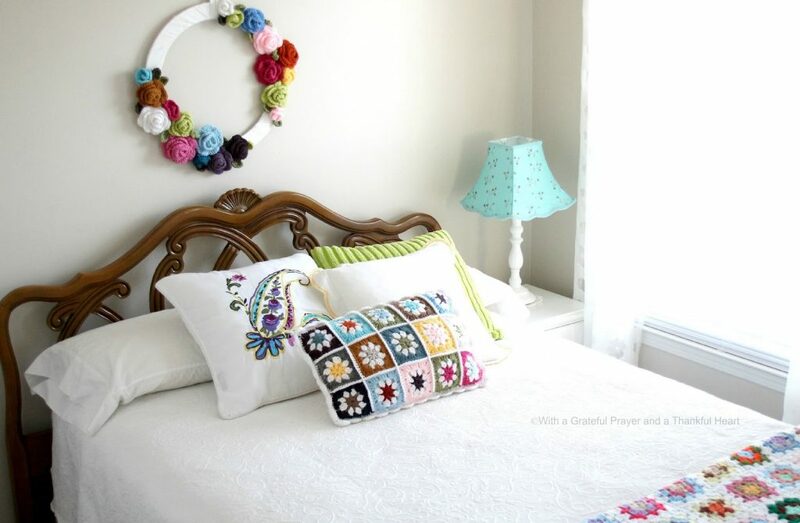 It matches the Granny square pillow and crochet Rosie Wreath I had made. 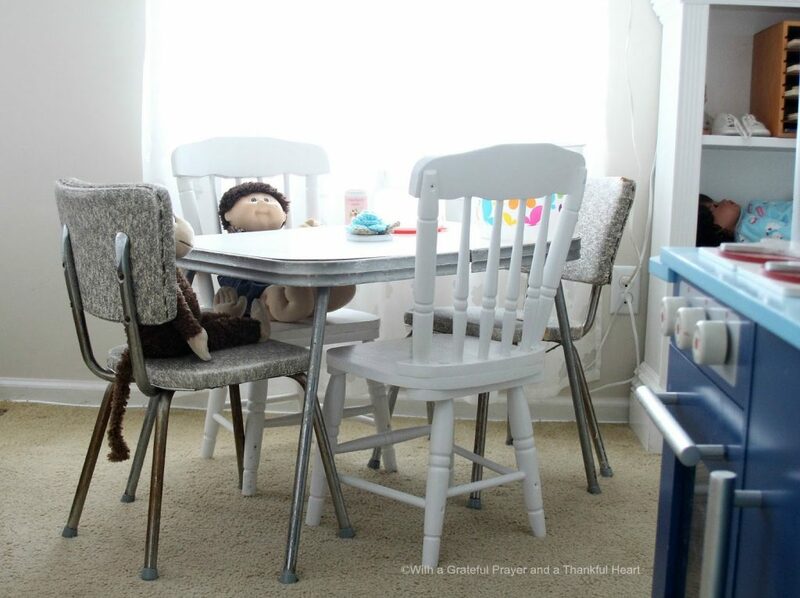 How it warms my heart that my grandchildren play at the table and chairs I received from my aunt when I was three years old! The white chairs belonged to my now grown and married niece, Toni. The blue kitchen set was found at a garage sale and the white shelf in the background was made by my childhood best friend’s father and given to me when I was a kid. 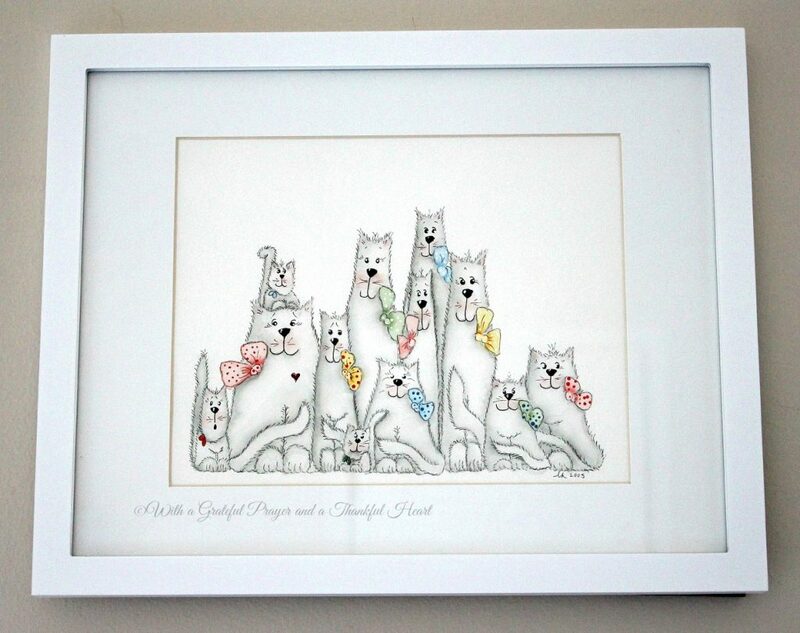 Colorful bows on this happy clowder of cats, done in pen and ink, continue the pops of color against a white background. 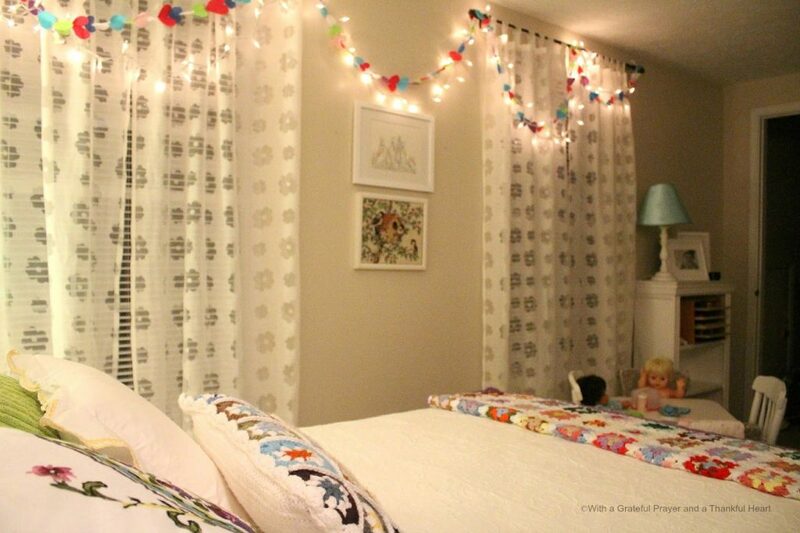 Warm and cozy at night to help hesitant little ones feel secure at bedtime. We will be watching two of our granddaughters for a week beginning February 1st. Chloe (age 2 1/2) is “Super Excited”. Cambrie (age 5) vacillates from “I think I am going to like this” to “I need my mommy”. Sure hoping all I have planned keeps them both happy and not too homesick. 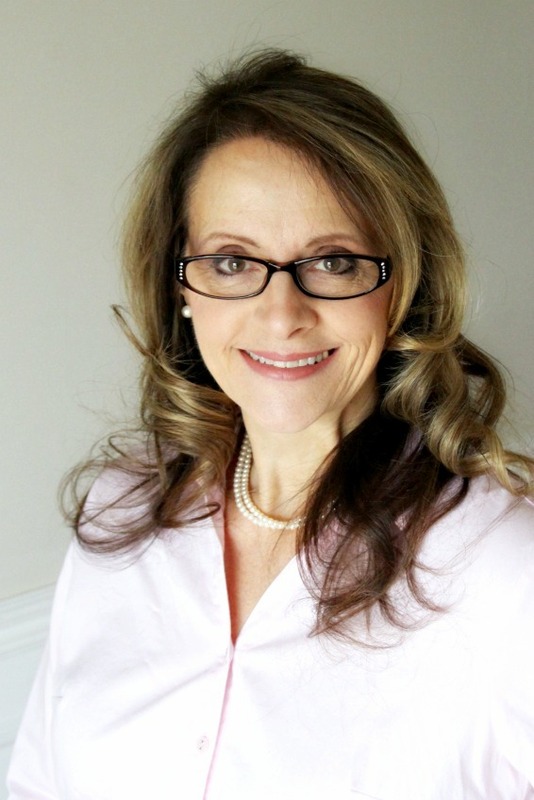 My sister, Carol, just went to closing on a house she sold. I lent a hand helping her pack. We began in mid-November and through sorting and wrapping, taping and stacking, hauling and heaving, lugging and loading, stooping and stretching, sunshine and raindrops, lost keys and cell phones and frustrating inspections, there was much chatting and memories, stories and updates, giggles and laughter and sisterly love. 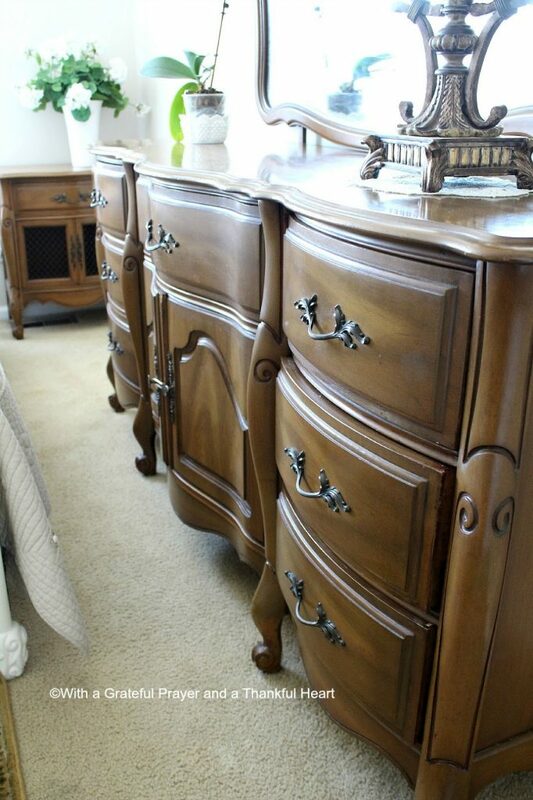 This vintage French Provincial bedroom set belong to our parents, purchased in the early 1960’s. 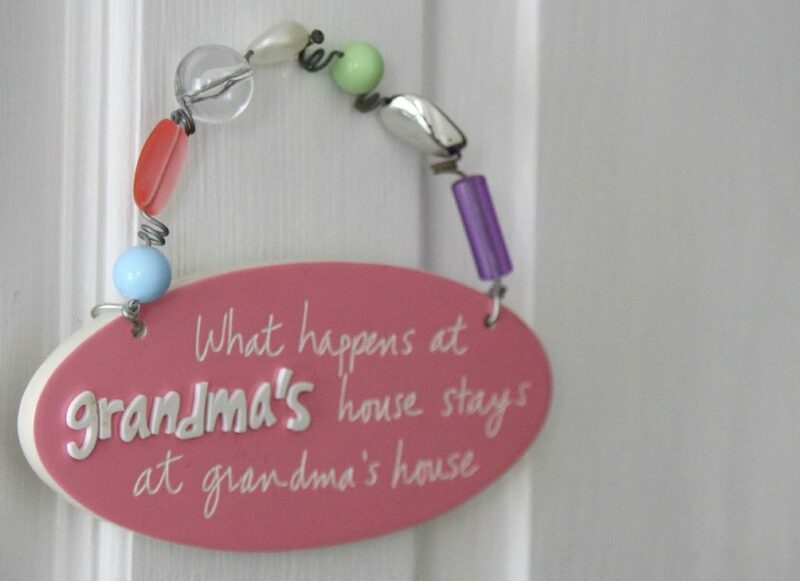 It went to Carol when Mommy passed several years ago and I got the new set mommy was then using. 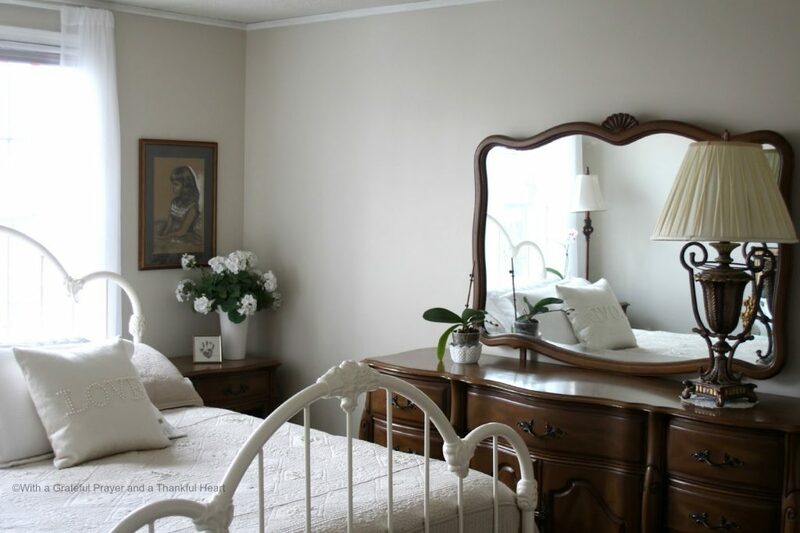 Carol doesn’t want to take this to her next home and though I wasn’t in need of a bedroom set, the sentimental value was too great to pass it up and now resides in our guest room. 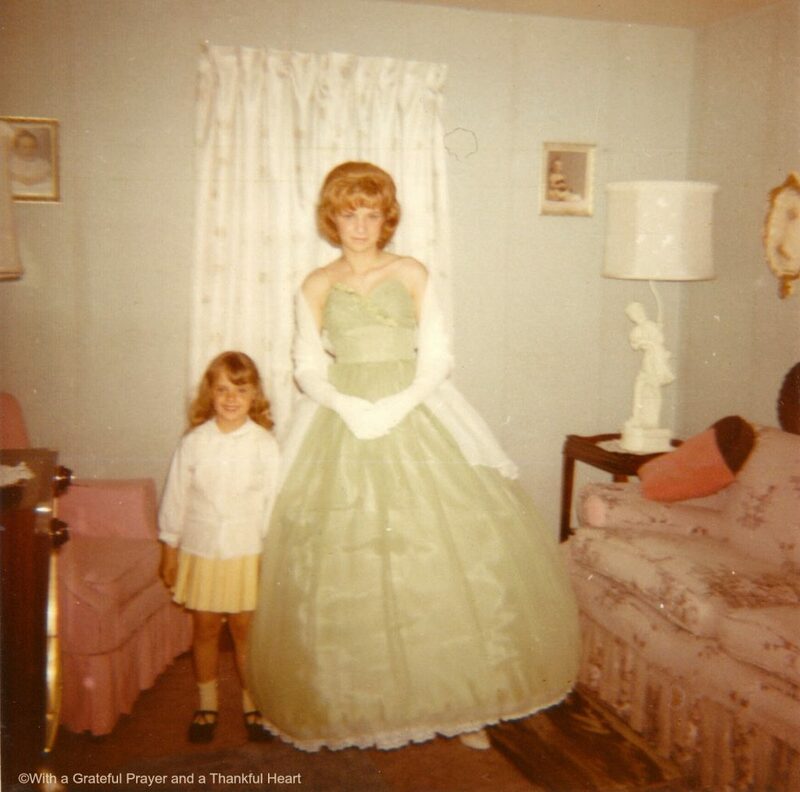 The chest on chest belonged to Daddy and how I remember, as a kid, snooping through his top drawer and seeing his neatly folded hankies, perfectly placed wallet, coins, keys, pens, deck of cards and trinkets stored there. 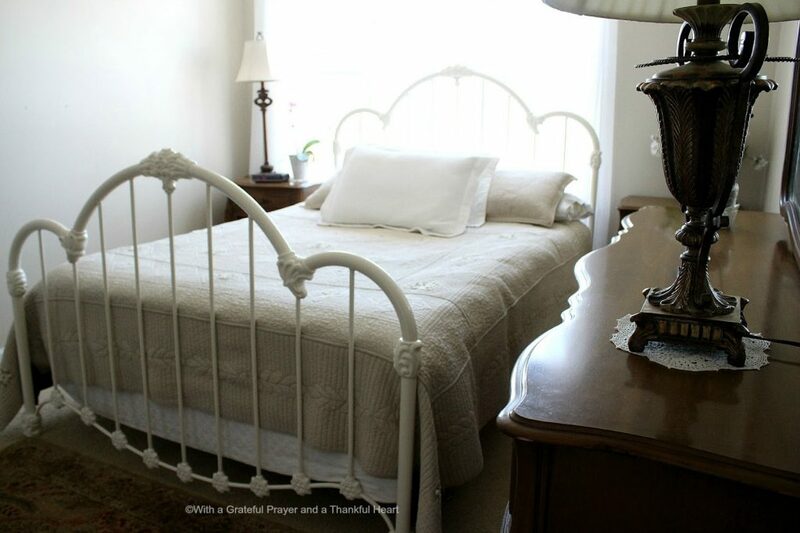 I left the white iron bed that we had purchased and used until we received mommy’s new set. 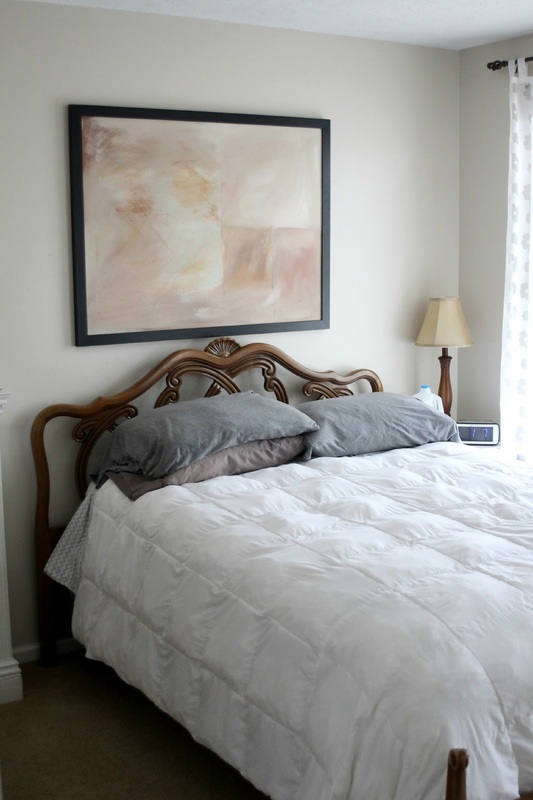 It is a queen-size and better suited for visitors than the full bed that is part of the set. I think it works with the other pieces. and still finding fun in being together. Next time, I will show you where I put the bed to this set and then my dining room changes. My Favorite Five. Here is that post. 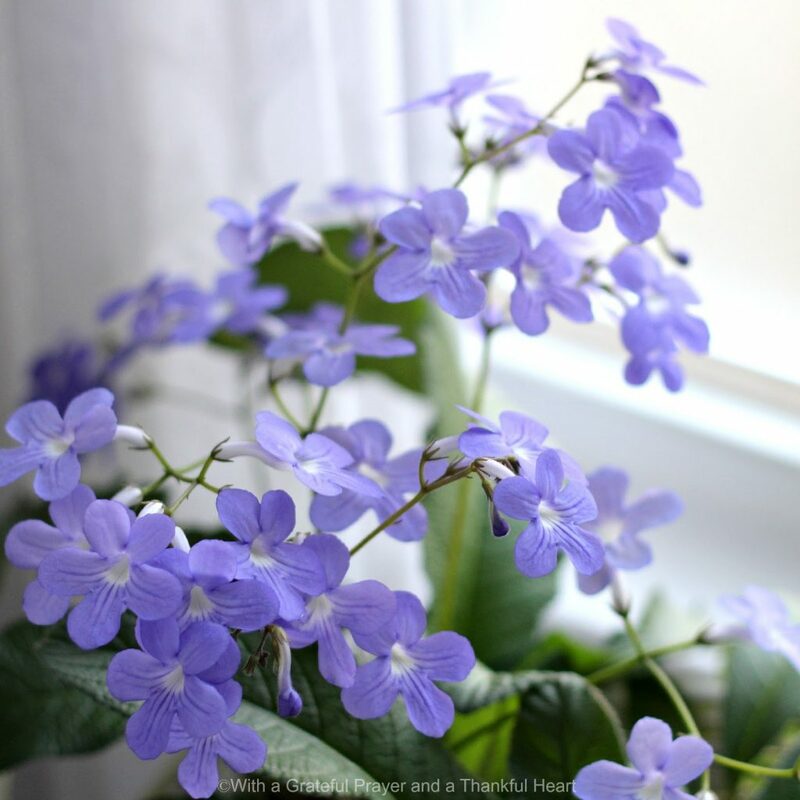 I am sharing five of my favorite houseplants that grow easily in the home as well as some of my care tips. Such a sweet flower and a favorite of so many. It is not recommended to have such overcrowding or so many crowns in one container but I just loved the profusion of flowers. 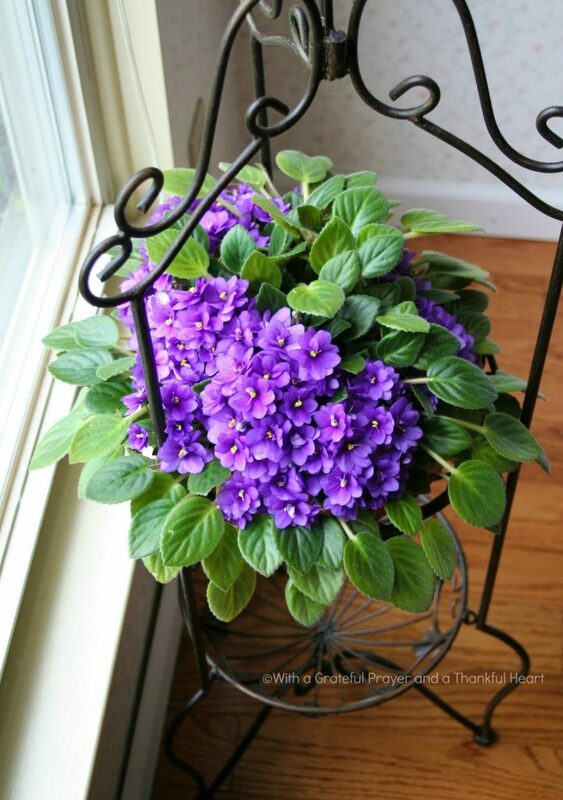 This happy African Violet grew by a southern window that receives late afternoon sun. 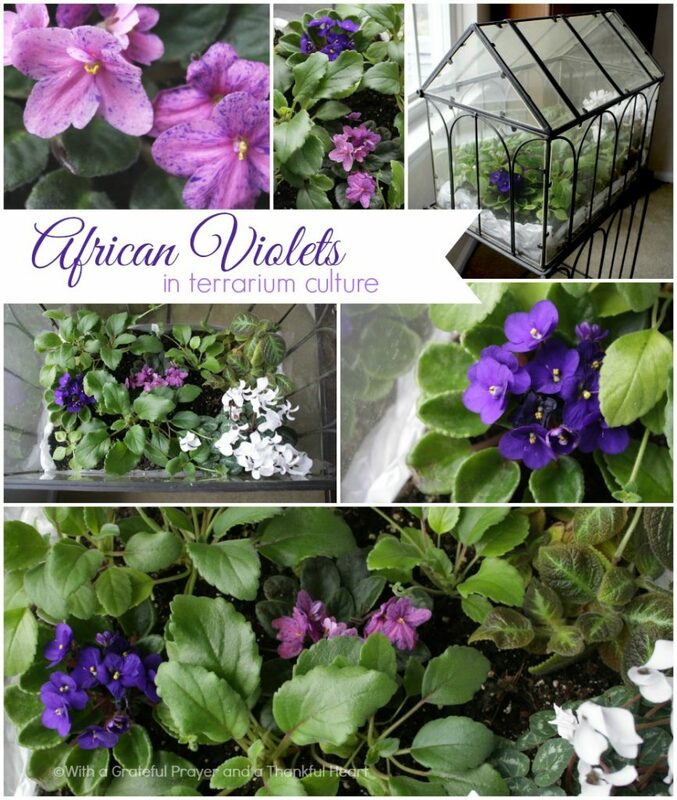 I currently have miniature African Violets growing in a terrarium. 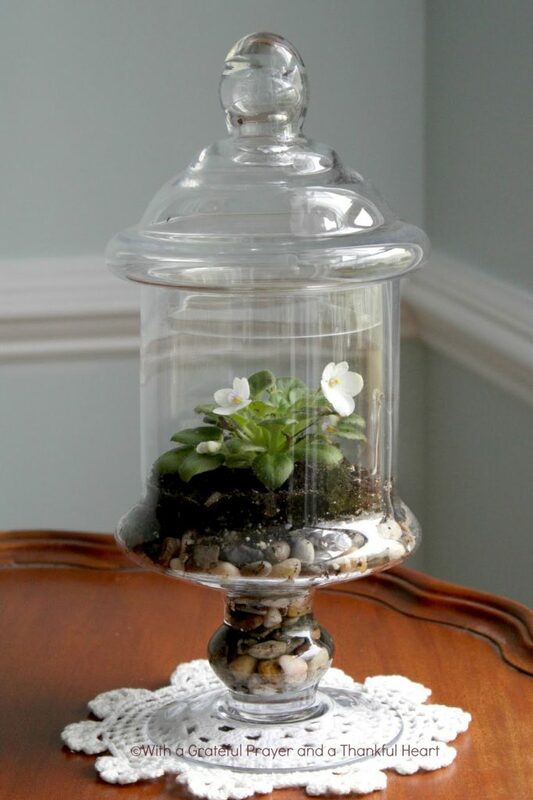 It is a large terrarium and not airtight so the humidity doesn’t get too high. It sits in an eastern-facing window. This little white miniature violet grows in a glass container. 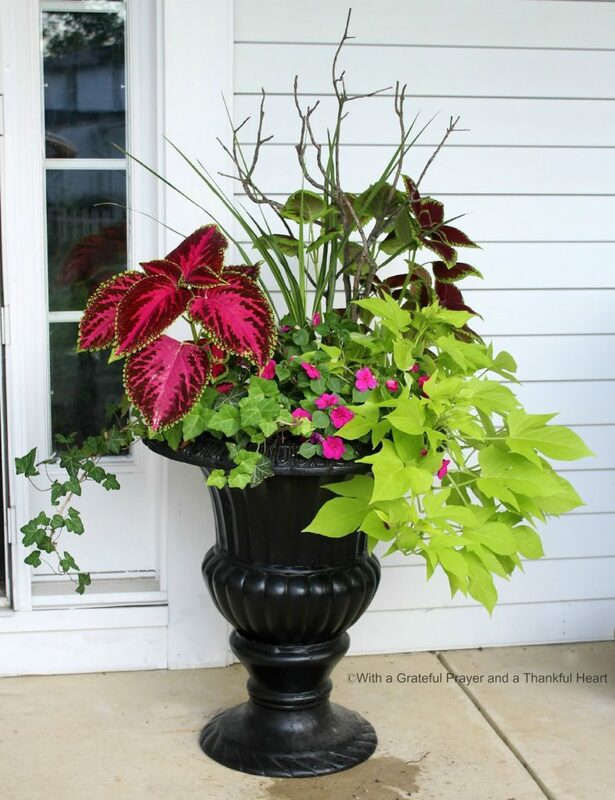 If you’d like to do something similar, fill the bottom with stones or gravel before adding new potting soil. If you see too much humidity building, especially during the peek of daily light, remove the lid. 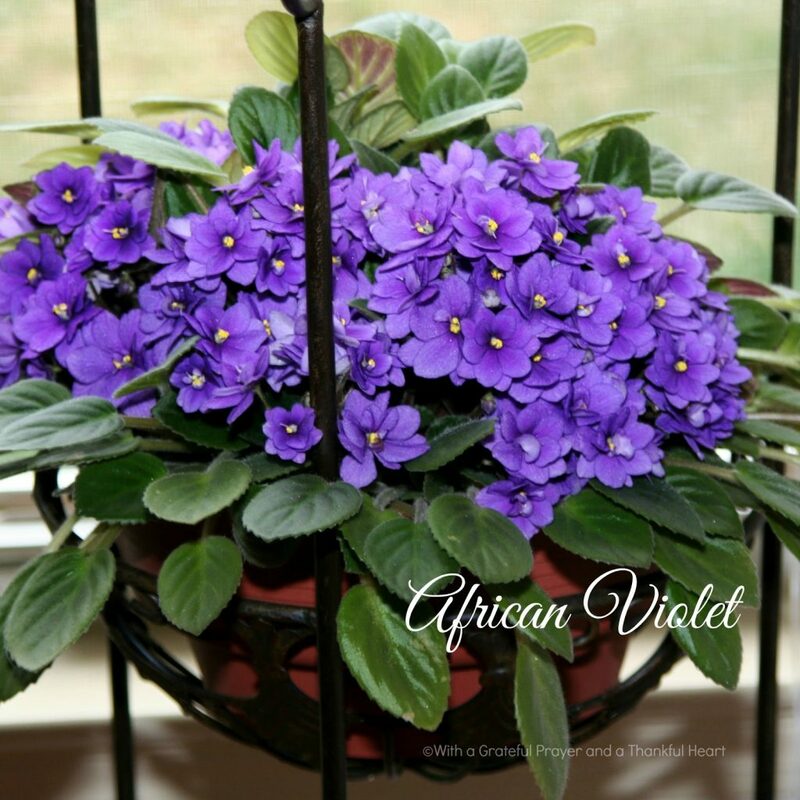 African Violets like lots of moderate to bright light, but never direct sun. I have grown them in a south exposure that gets only late afternoon sun. 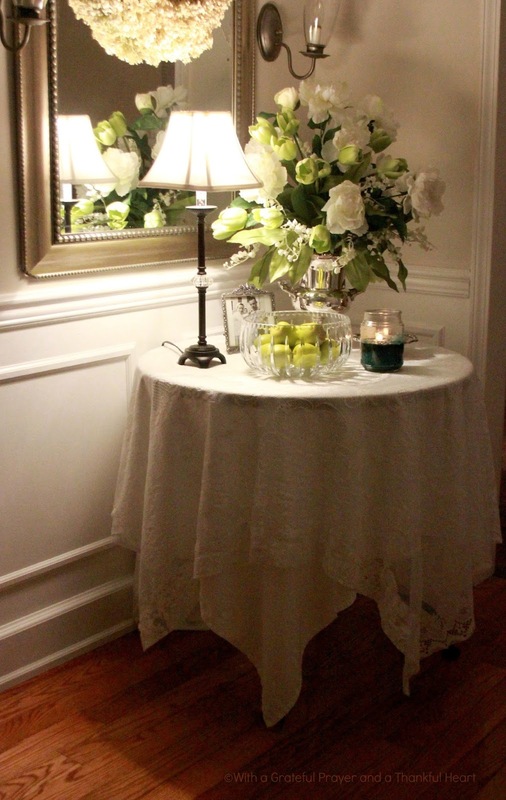 Too much light will cause the leaves to turn downward and variegated leaves to become all green. Too little light and the plant will grow leggy and produce few flowers. 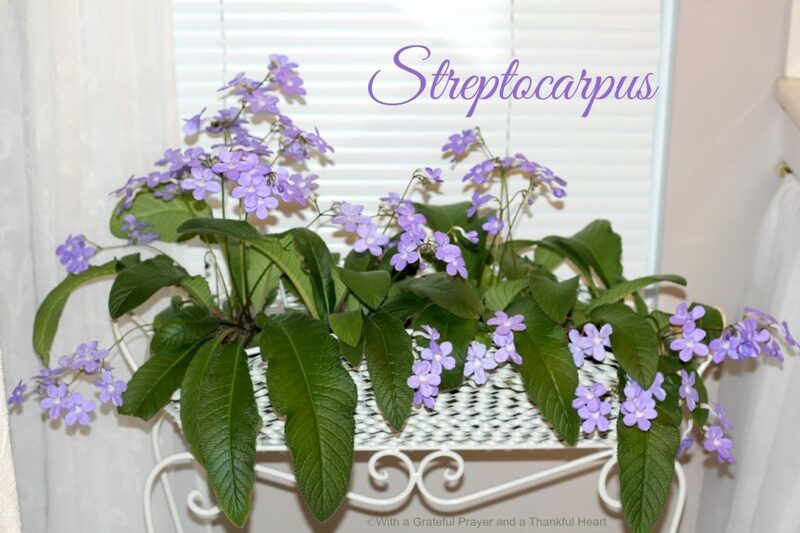 Streptocarpus is in the African Violet family, and these plants have been growing in an western exposure window of my master bath for years! They receive medium to bright indirect light with a wee bit of late afternoon sun. They have a very long bloom period and are just so sweet and cheery. Delicate, tubular flowers on thin stems cascade over the long, deep green leaves. 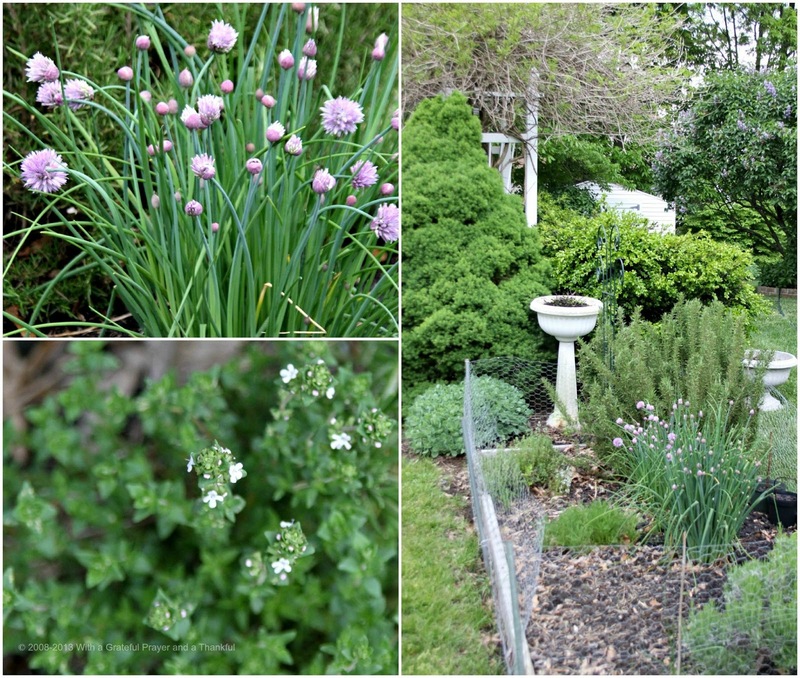 A profusion of pretty lavender flowers! 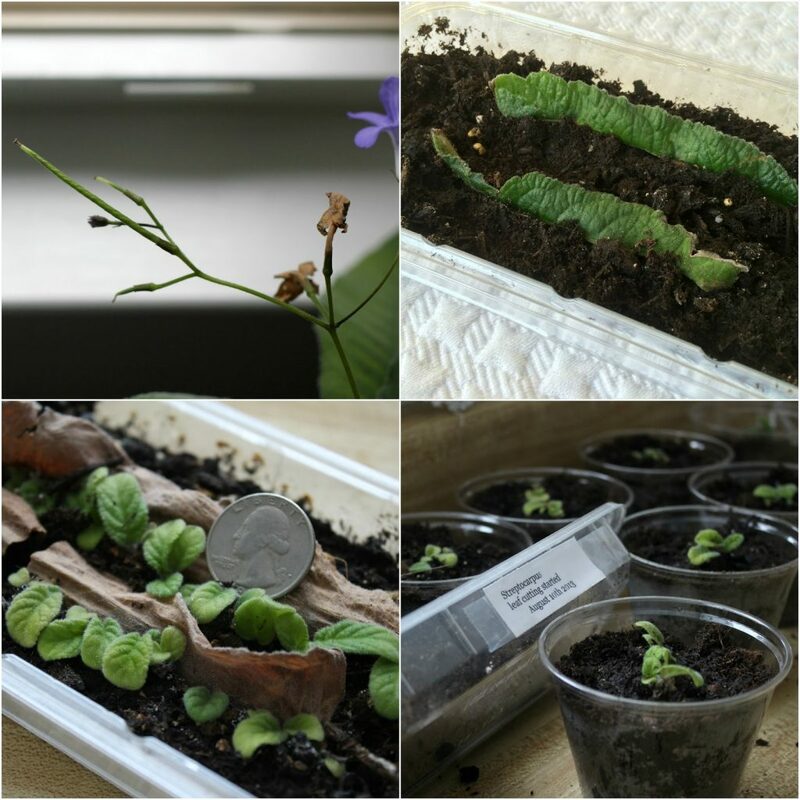 Streptocarpus are easy to propagate either from seed or leaf cutting. 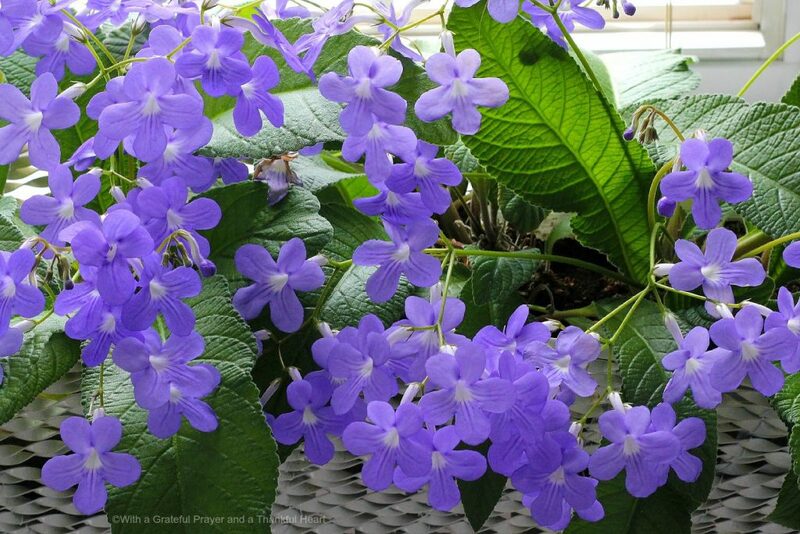 To keep your Streptocarpus tidied up, snip away faded flowers and leaves that become pale or limp. I do this weekly during the flowering period. But, if you notice a seed pod developing where a faded flower fell, you might find it fun to allow it to mature. When fully mature, this pod will be full of tiny seeds. My preferred method of creating new plants to enjoy or to give to friends, is leaf cuttings. Simply cut a healthy leaf lengthwise along the center vein with scissors. 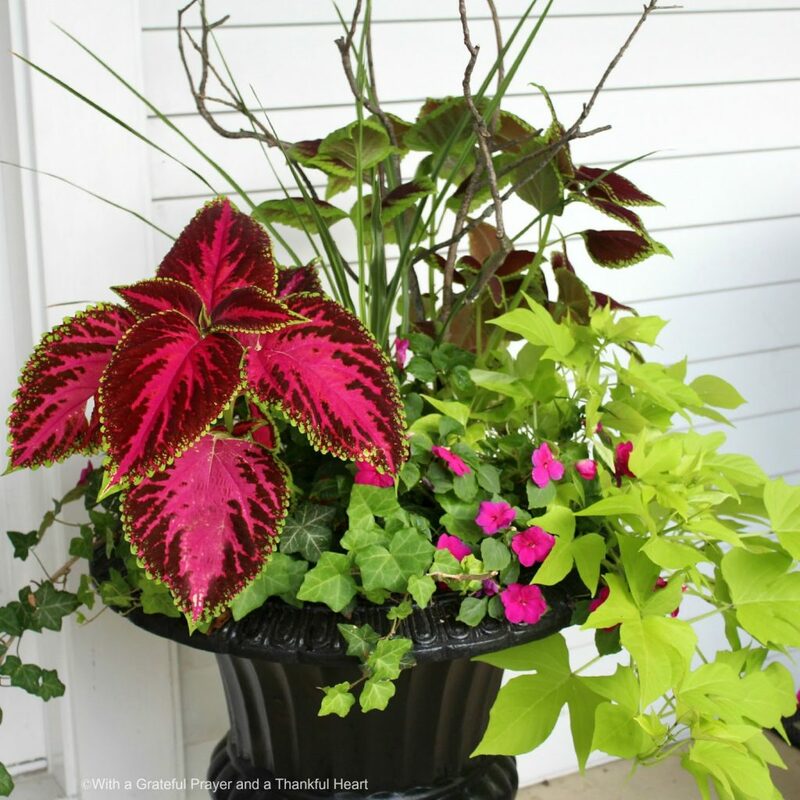 Secure the cut edge of the leaves in fresh potting soil; keep moist and place in a zippered plastic bag, leaving it open (or partially open) so there is the right humidity and the soil doesn’t get too dry. Give it bright, indirect light and after a few months, you will have many little baby plantlets. Separate the new plants into individual containers. Many years ago, a neighbor gave me my first orchid and I have grown them ever since. I used to be ambitious and move the orchids outside to our shaded patio so they would receive lots of summer heat and humidity. They did well but got dirty; then as autumn approached, I had to clean them up and them bring back indoors. 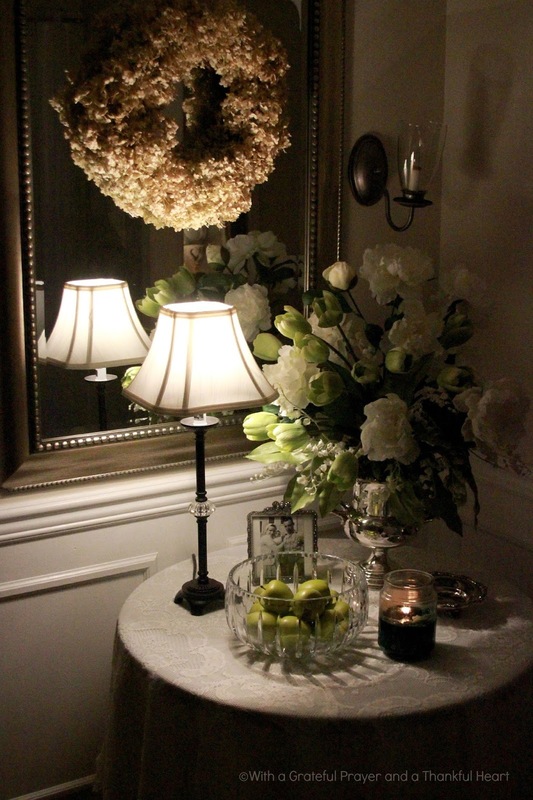 Now, they remain, year-round, in our dining room at a southern exposure window. 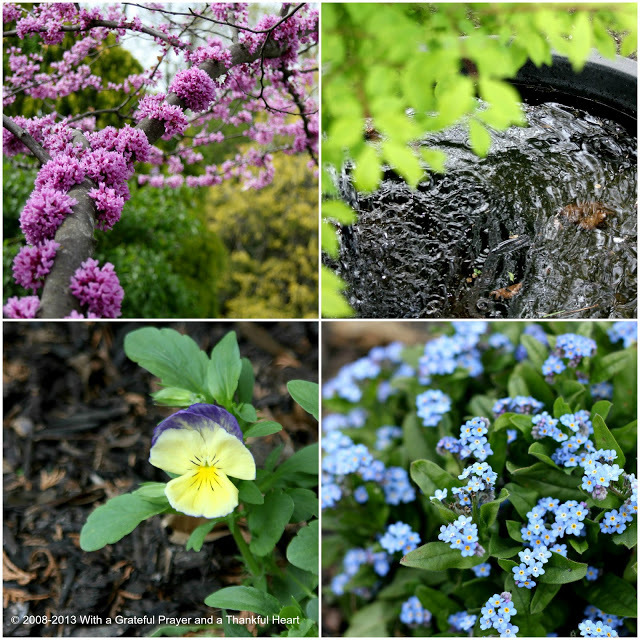 They flower, usually twice a year and the flowers last a very long time ~ some several months! I water twice a week and really, that’s about it for their care. Tip: When the flowers fall and you don’t see any new ones coming, do NOT think your orchid is dead. 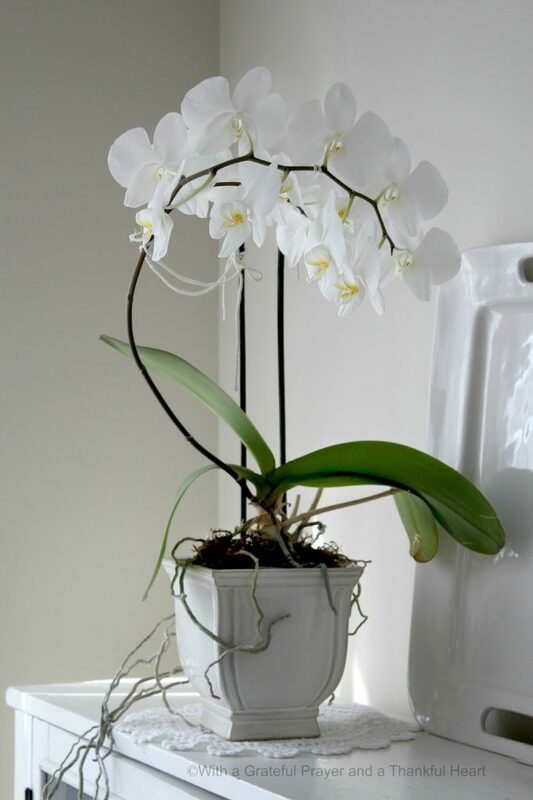 Do not cut off the stem that had the flowers as often times the orchid will send out additional buds on it. Only cut away the stem if it turns yellow and becomes woody. 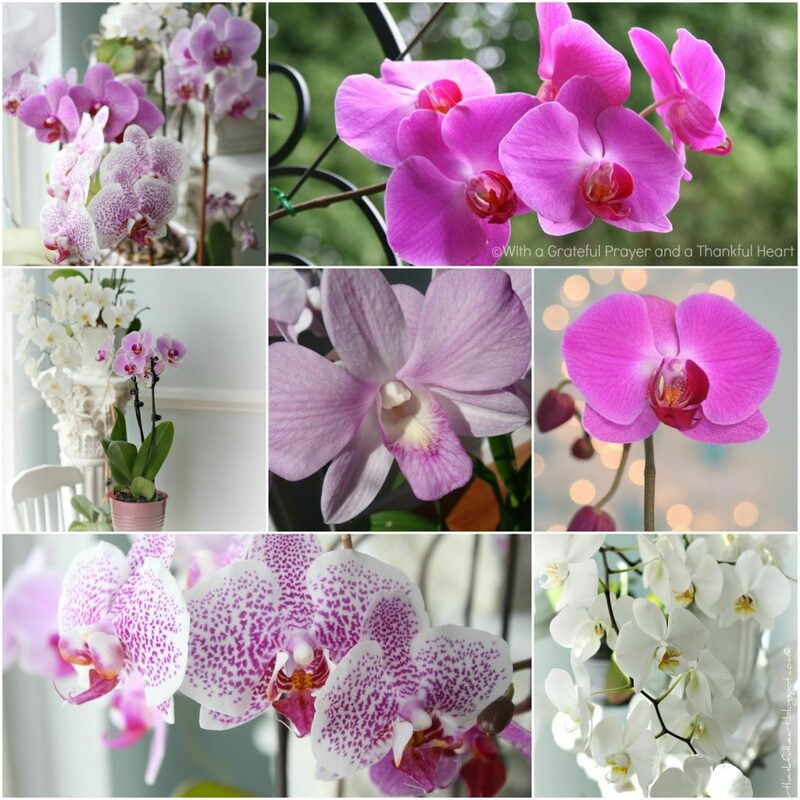 The orchid usually sends out a new leaf after flowers fade and will eventually produce a new flower stem. 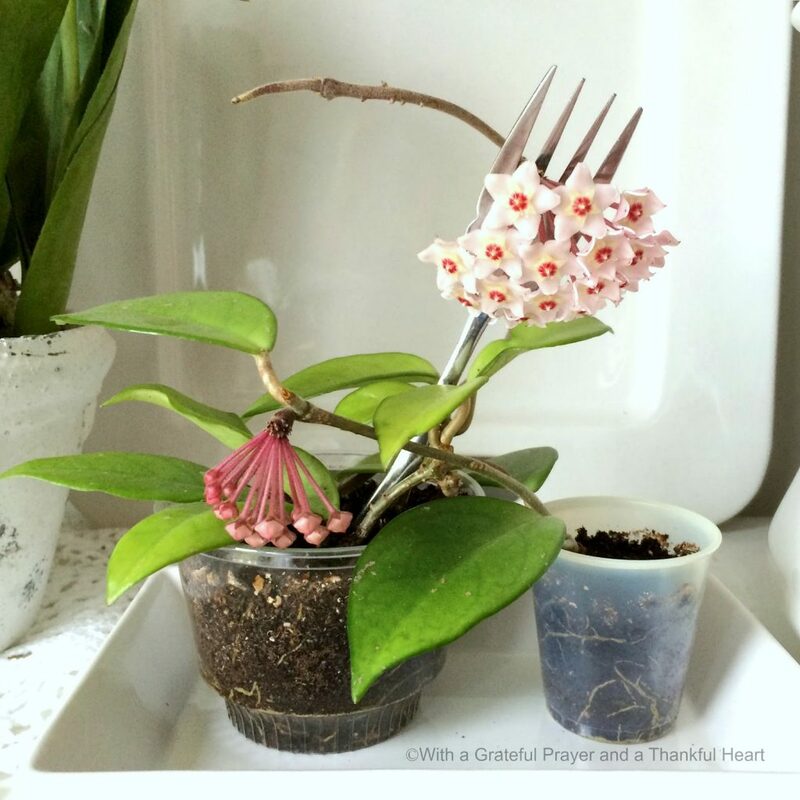 Our son-in-law’s mom gave me a cutting from her Hoya plant and told me about the unique flowers it got when blooming. The stem rooted quickly in water and then I planted it in soil. 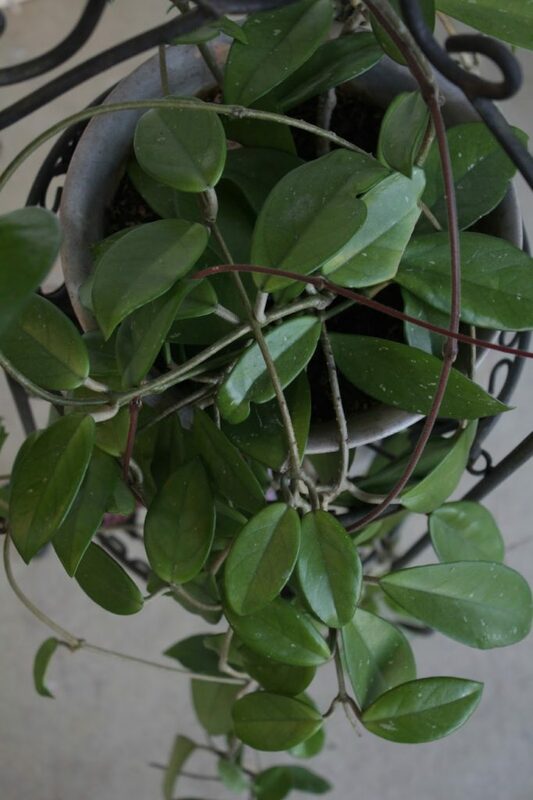 It grew quickly, sending out many vines with dark green, waxy leaves. How excited I was when it bloomed for the first time! 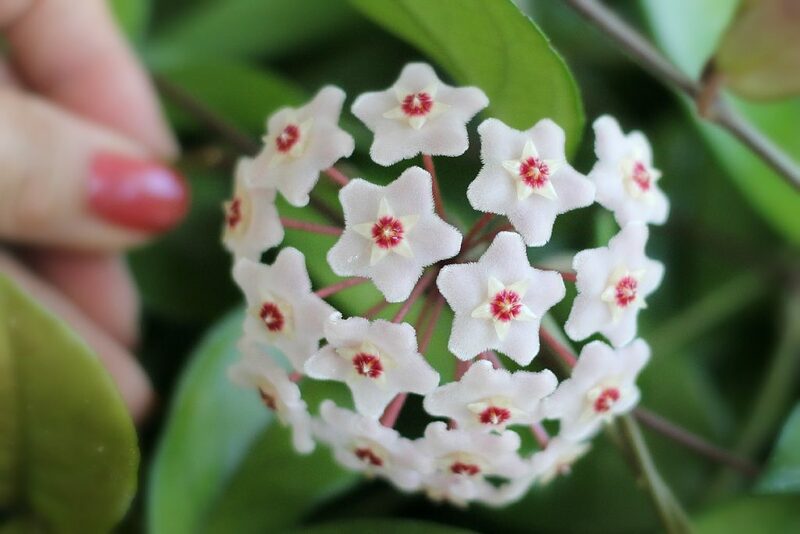 The small clusters of lightly, sweet-smelling, star-shaped flowers are amazing! 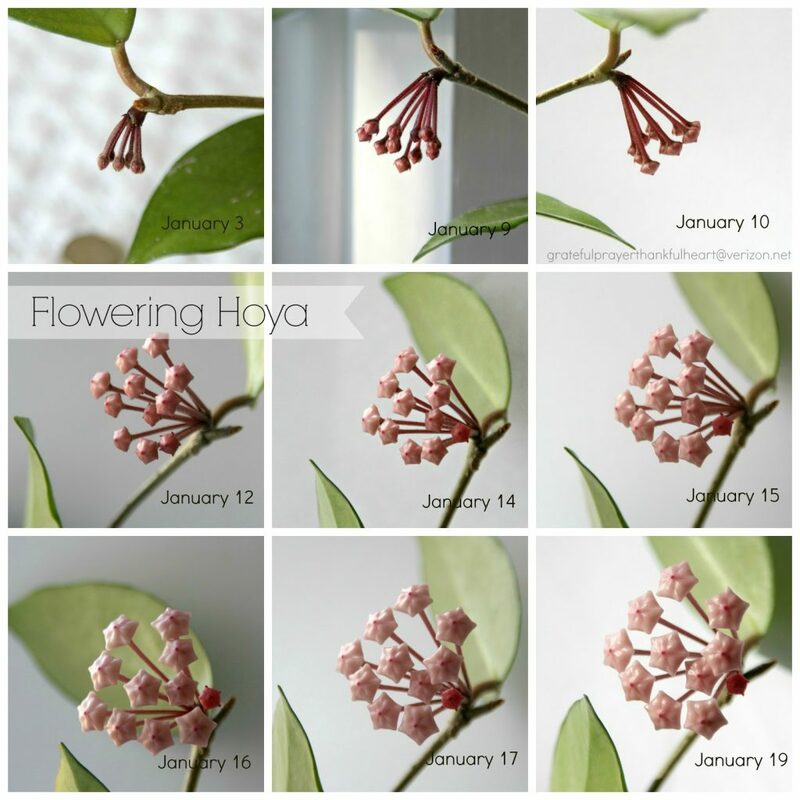 Watching the Hoya cluster develop day-by-day is fascinating. I was delighted to see a young plant that was just rooted in the fall produce a flower. I was even more excited to see a second flower beginning right where a spent flower recently fell. Some years I take the Hoya outside. 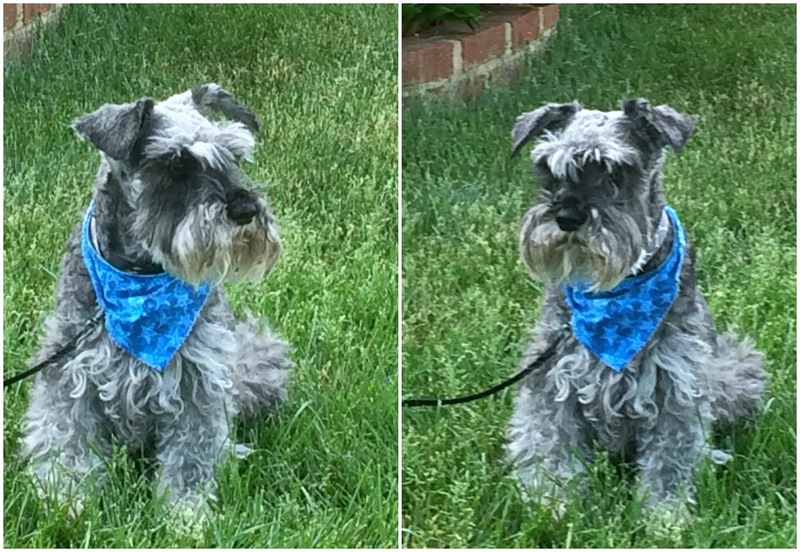 It enjoys spending the summer on the patio in bright, indirect sunlight. I allow the soil to dry slightly before watering. Hoyas grow large quickly and mine had outgrown my space. I took a cutting from it before giving it away. 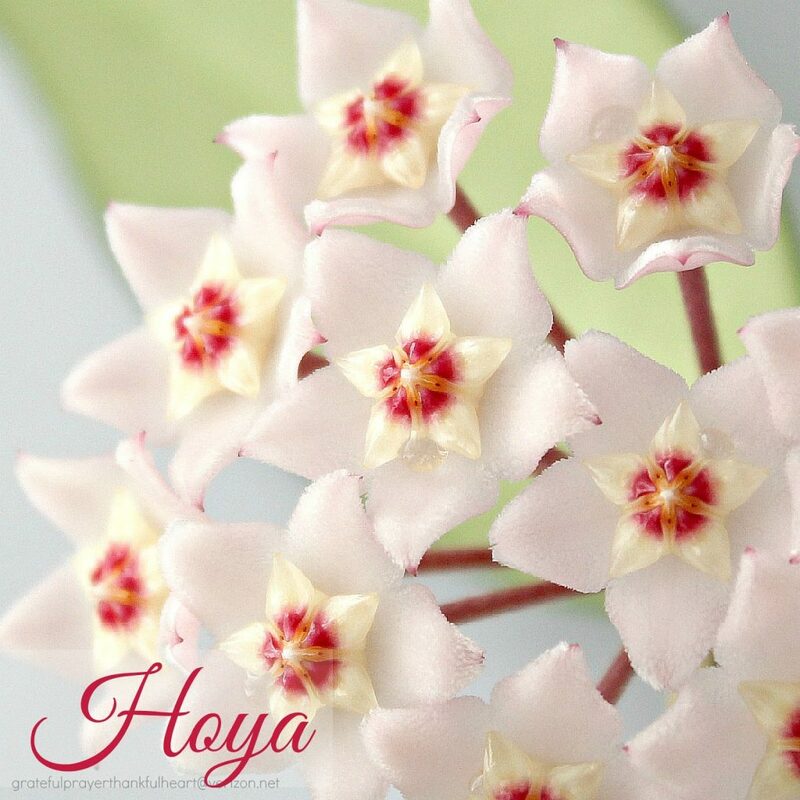 This is my current Hoya ~ and I will soon transplant the starter windowsill cuttings. 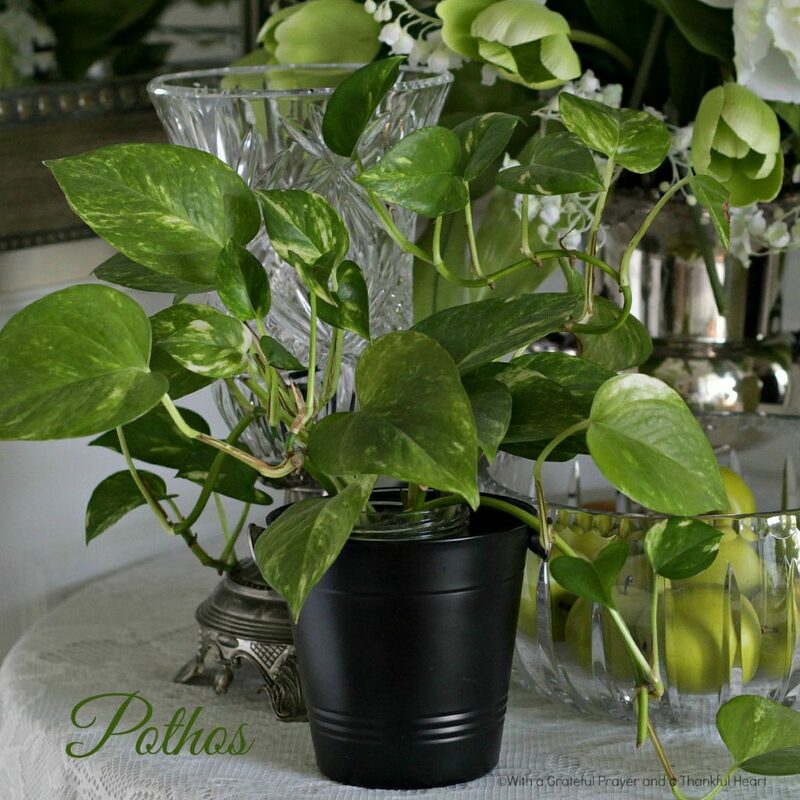 For ease in care and tolerance of low light, Pothos is a star performer! Although not grown for flowers, the heart-shaped leaves and bright green color make it a lovely plant to brighten your home or office. 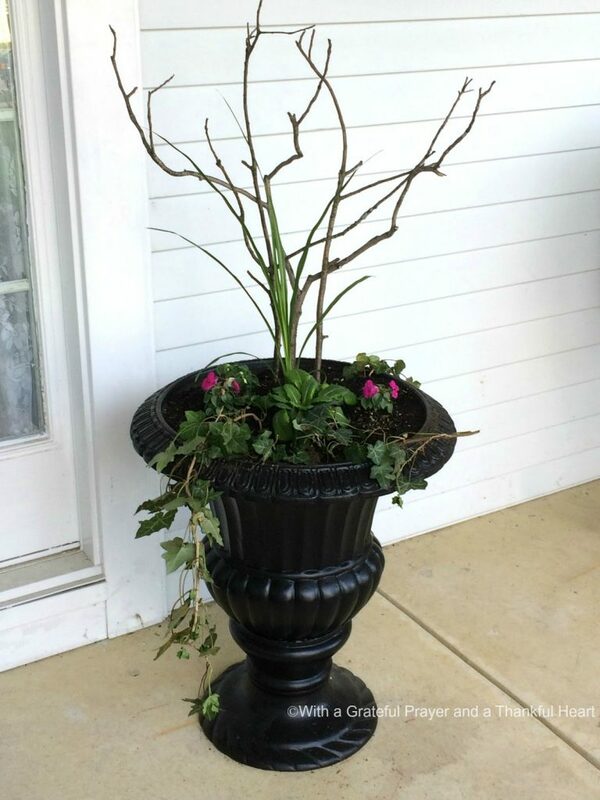 A cutting will root easily in water and when potted in soil, can be attached to a support to grow upright or allowed to trail. 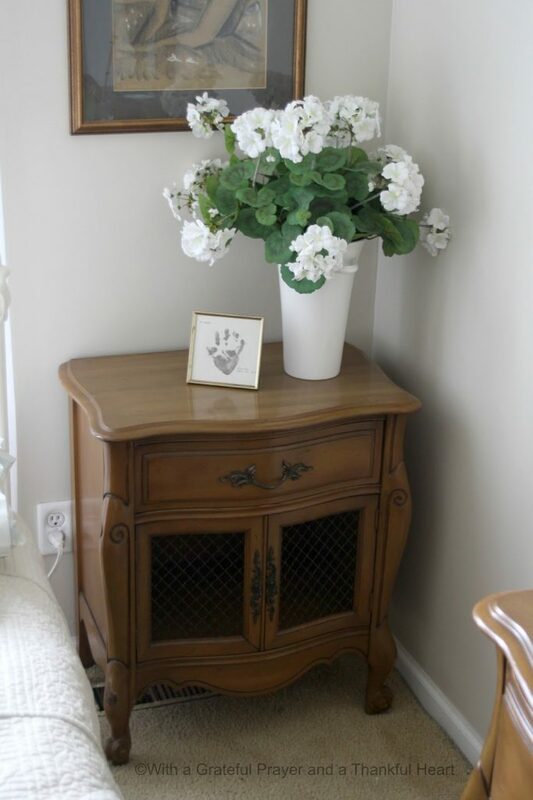 A Pothos placed on the top of a bookshelf or hutch will trail and vine beautifully. Pothos are very easy to grow. Your biggest chore will be keeping the vines from taking over. They like bright, indirect light but I found them to tolerate low light conditions well. 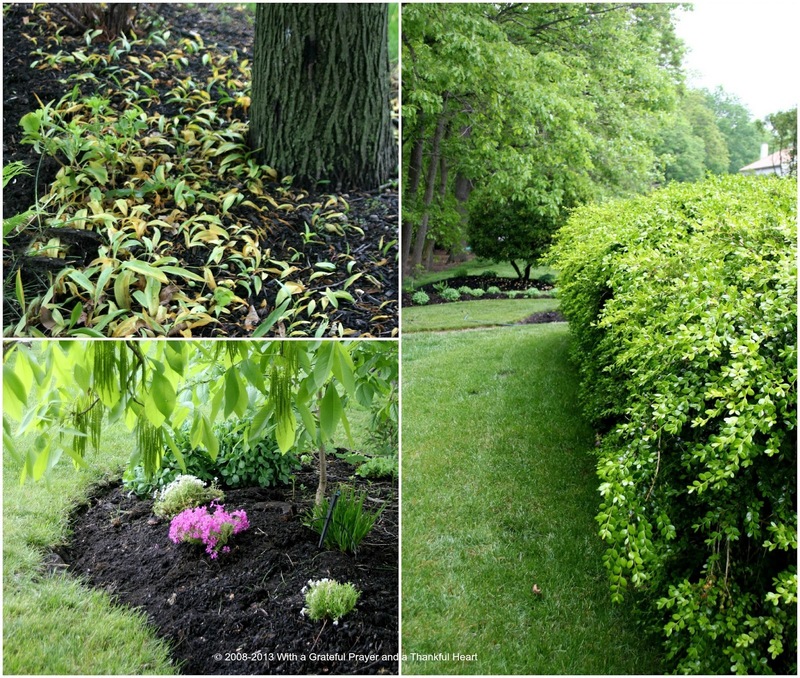 Allow the soil to dry slightly between watering. Growing houseplants adds beauty to your environment, helps improve air quality and can just be relaxing and therapeutic as you care for them. 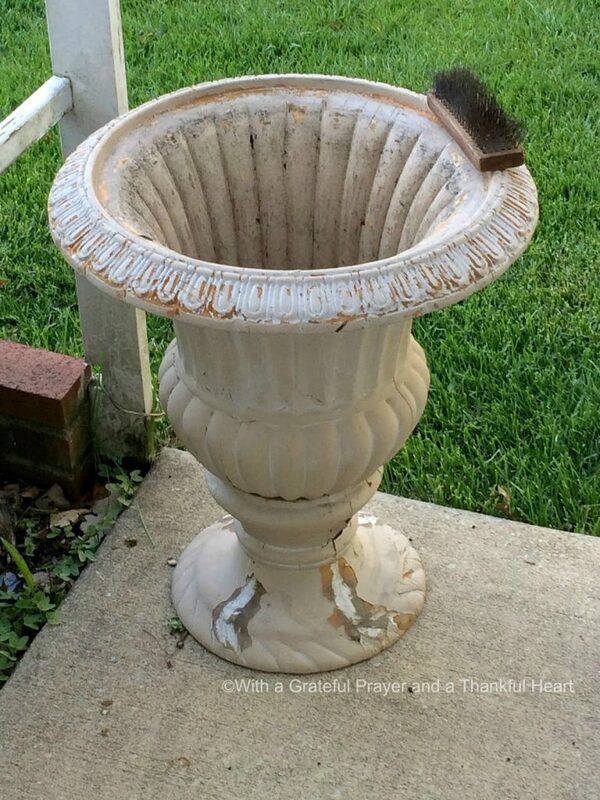 Do you have beat-up, sad looking planters, that have seen better days? I do, or rather did. I finally got around to tackling a project that was easier than I thought making me regret my procrastination. I found a very large foam planter at a garage sale. 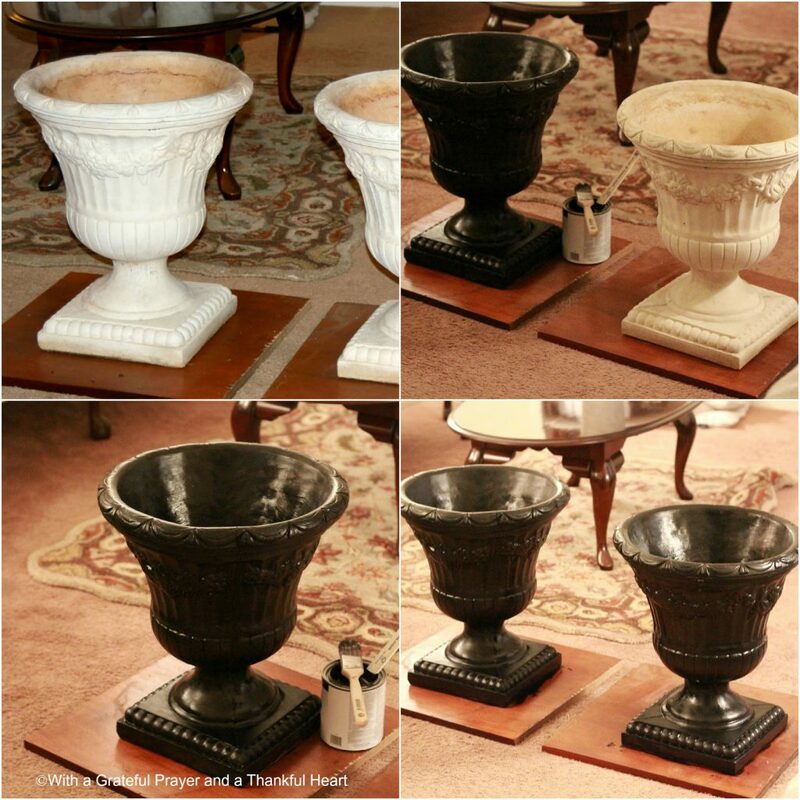 It was in pretty bad condition but I loved the classic urn style. I bought it and loaded it into the car~ a big, dirty, chippy mess. Look at it now! 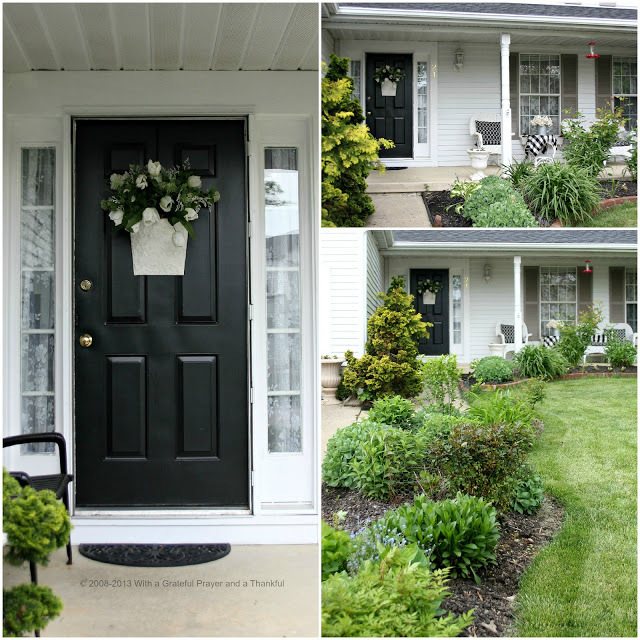 Filled with greens and flowers, it stands quite impressive by the front door. You can see why I procrastinated. I went over the container with a wire brush to remove as much flaking as I could then wiped it with a rag to be sure it was free of dust and particles. 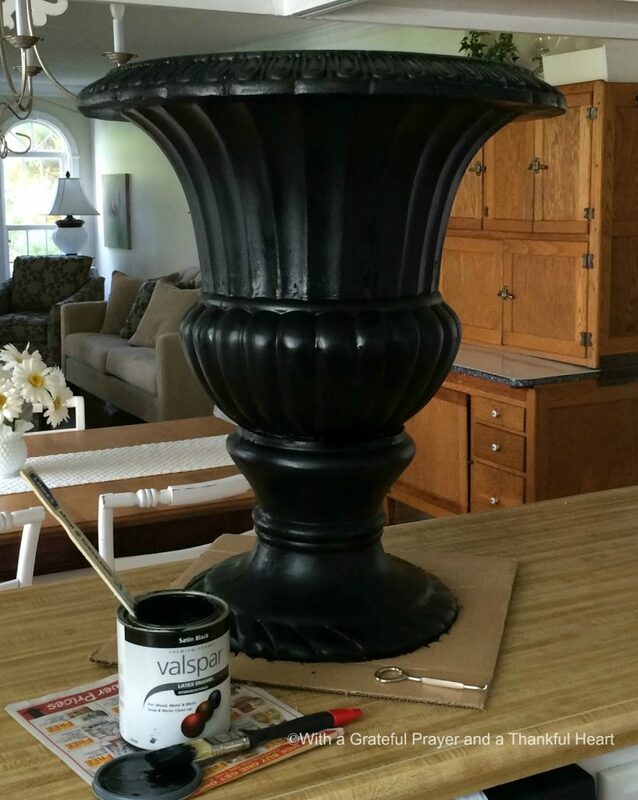 I gave the planter a coat of paint using Valspar latex enamel interior/exterior (for wood and metal) in Satin Black. It did a great job covering and I only needed a light second coat. 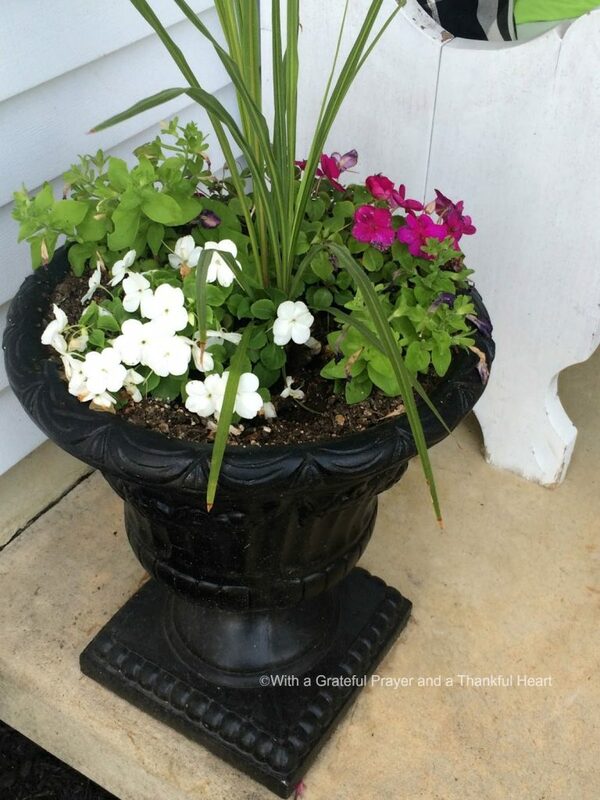 Before filling with potting soil, I placed an inverted flower pot into the bottom. No need for soil where roots don’t go. A few sticks from the back yard for height, and pieces of ivy and a primrose dug from the garden were added to the planter. 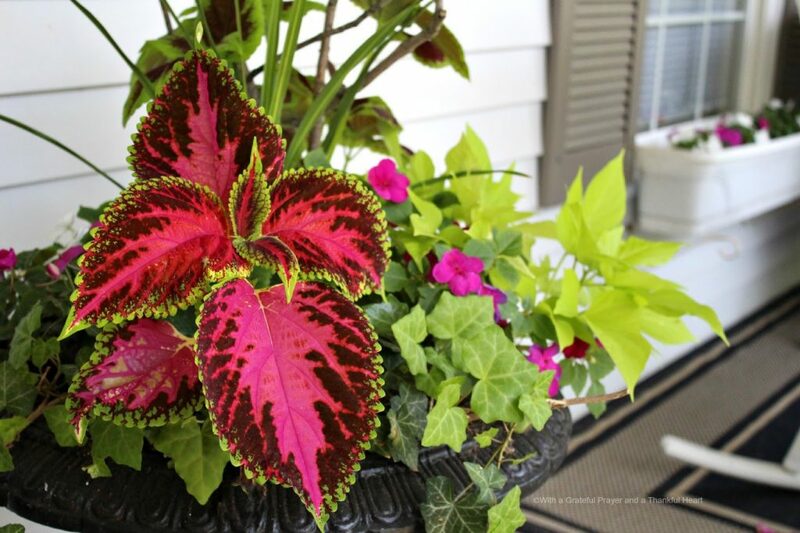 Then coleus and impatiens that were started from seed and grew on a window still until ready for planting. 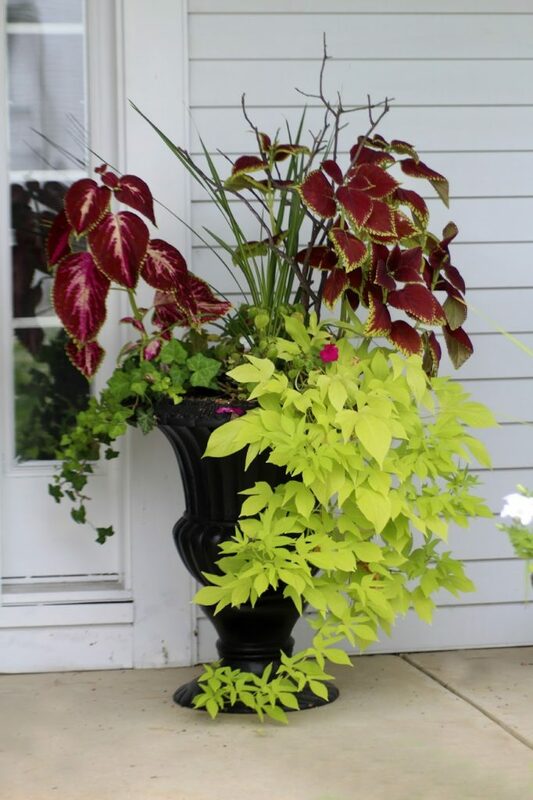 Lastly, I added a gorgeous colored sweet potato vine. 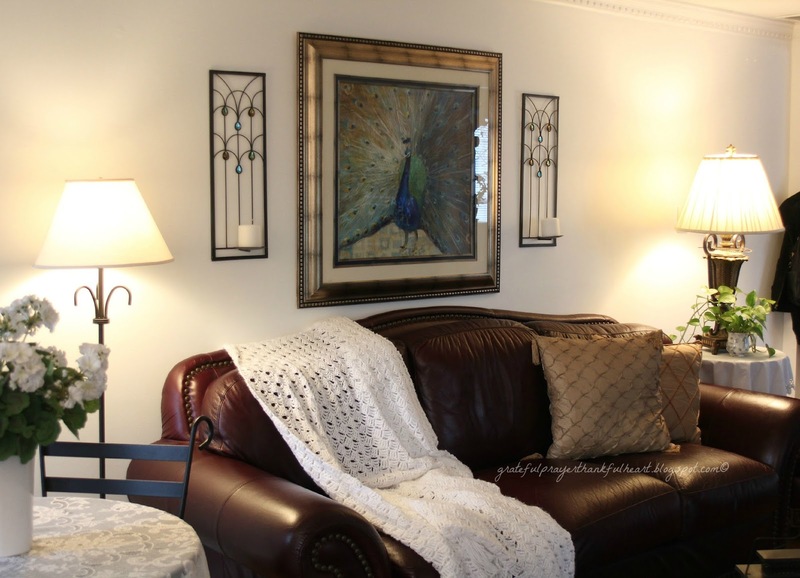 It matches pillow covers I made to accent the cushions and pillows I covered a few years ago. Just a little time and already it has filled in and spilling over. I used the same paint on a pair of concrete planters. These rascals were way too heavy to hoist onto the kitchen counter! 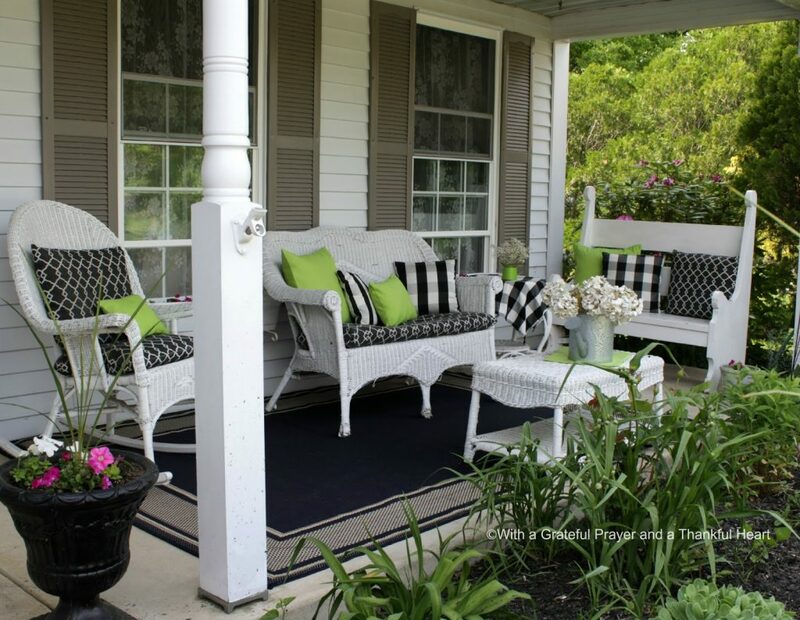 This pair of planters have been on my front porch for many years and now look renewed with a few coats of paint. 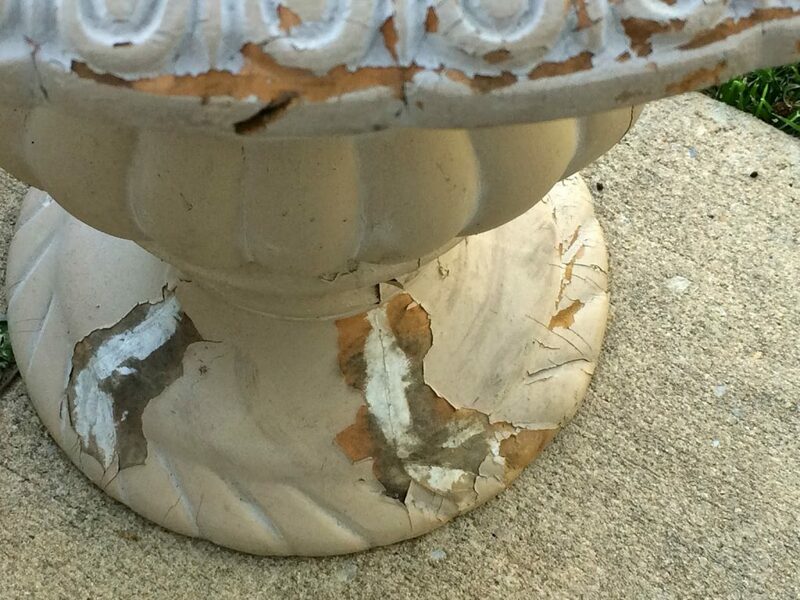 The wicker could use a fresh coat of paint and the bench is chipping. The lawn needs mowing and there are weeds to pull. Always work to be done but I think I will sit a spell before moving on to the next project. Love for you to join me! 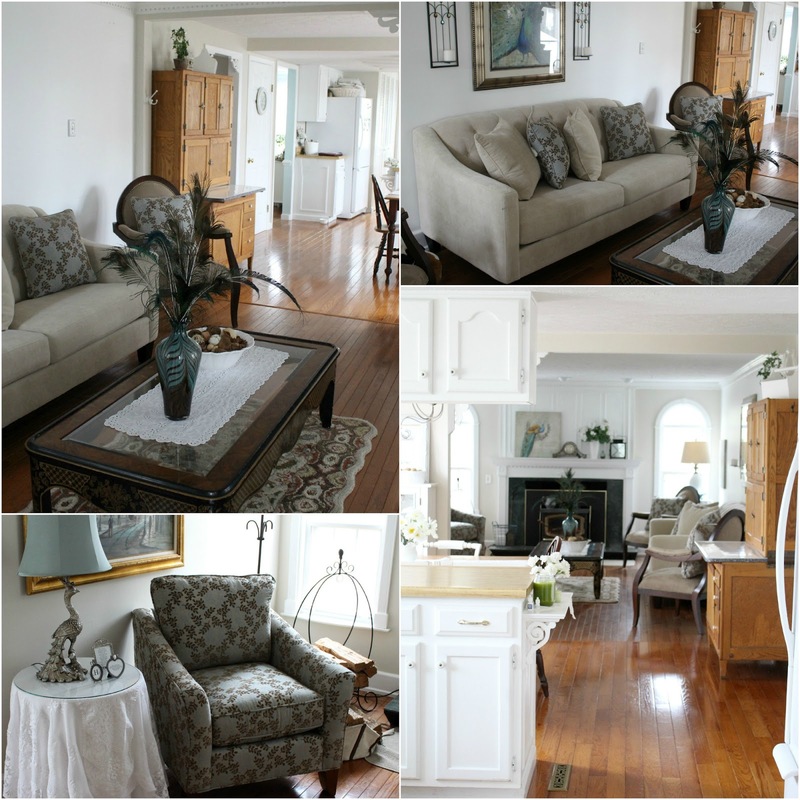 Our oldest daughter, Erin, recently moved into a new home and had the opportunity to purchase some of the furniture. 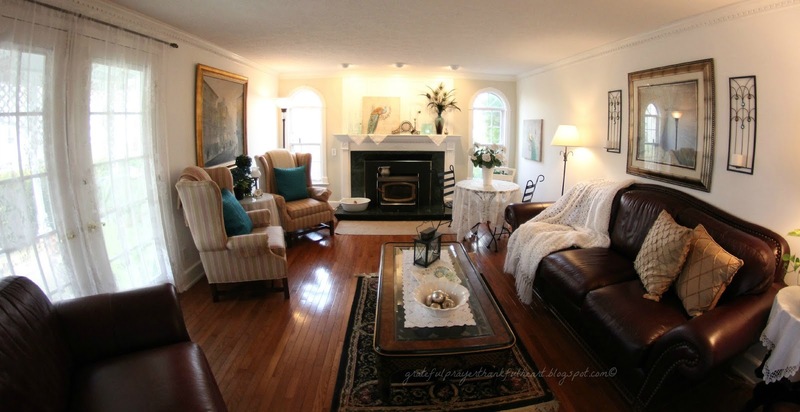 My heart skipped a beat when I saw her sofa and chairs and couldn’t help thinking how perfect they would be in my home. They didn’t really match her other pieces as she prefers soft, cushy leather. Of course, not until I agonized over the decision. The pieces were beautiful and the colors so right. 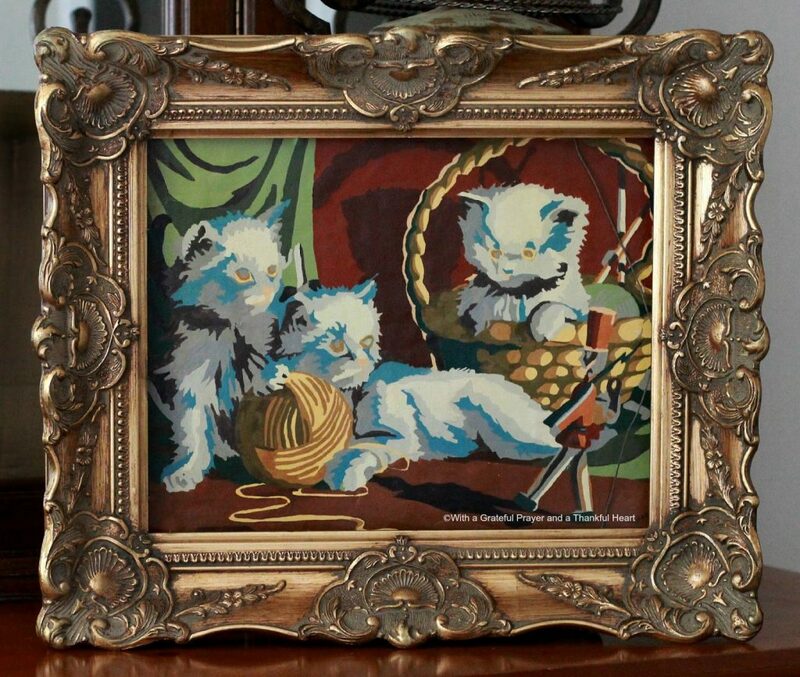 But, for my family room? They suggested I spray them with Scotchgard. Has anyone done that and if so, did it help prevent stains? what do you think? just right, huh? 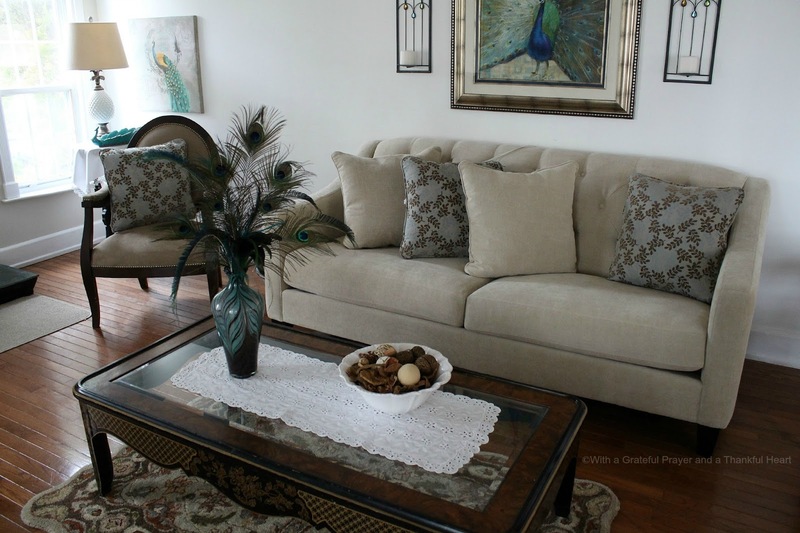 The tan sofa and the two patterned chairs came from Erin. The two oval-back chairs belonged to my mom and have been in our bedroom. 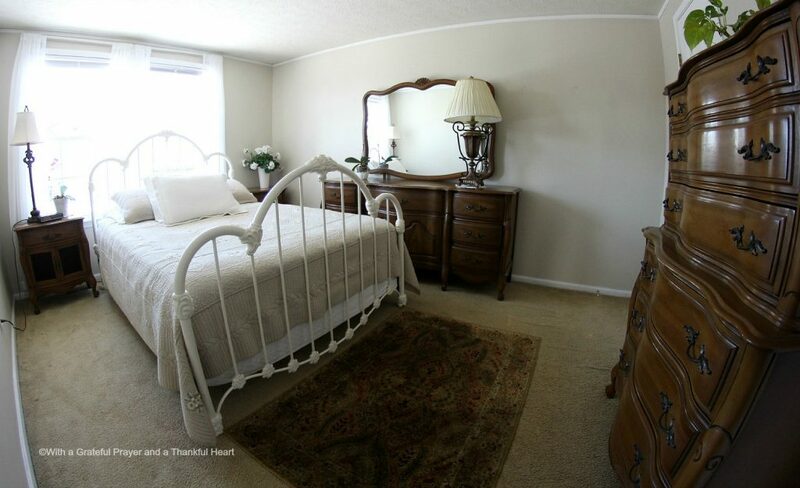 I took the two garage-sale wing-back chairs that were in this room to our bedroom and they actually look okay there. 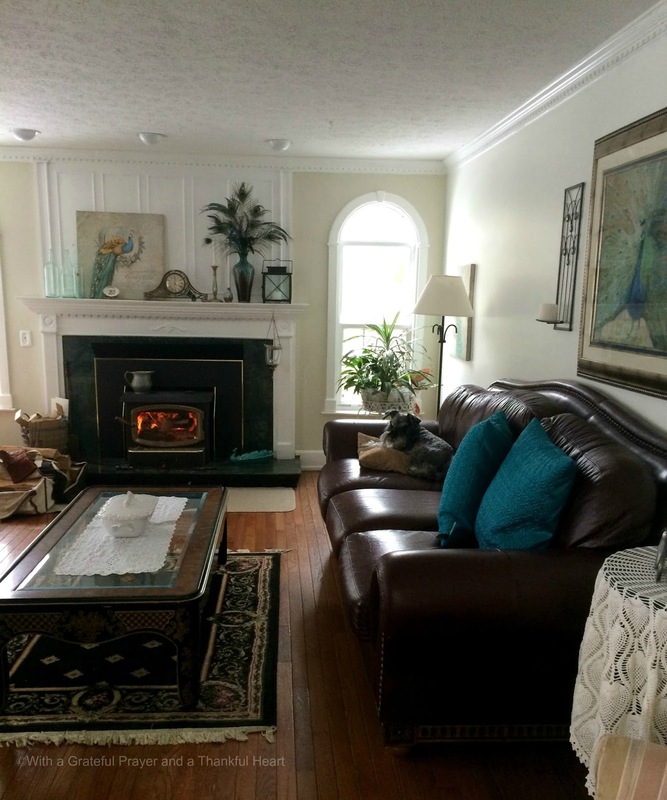 I also switched the rug under the coffee table with the one in our living room. We had to wait a couple of weeks to make the switch because of all the snow we have been having. This is the leather sofa. Nice, big, cushy, soft, easy to wipe off sticky stuff. 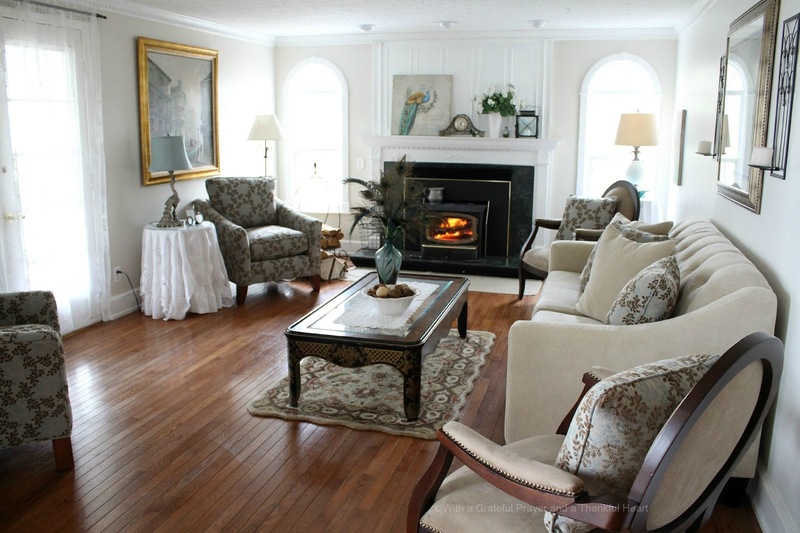 With matching over-sized armchair that held lots of wee folks, with an equally over-sized ottoman. Very nice. But… dark. And, you all know I like light and white. 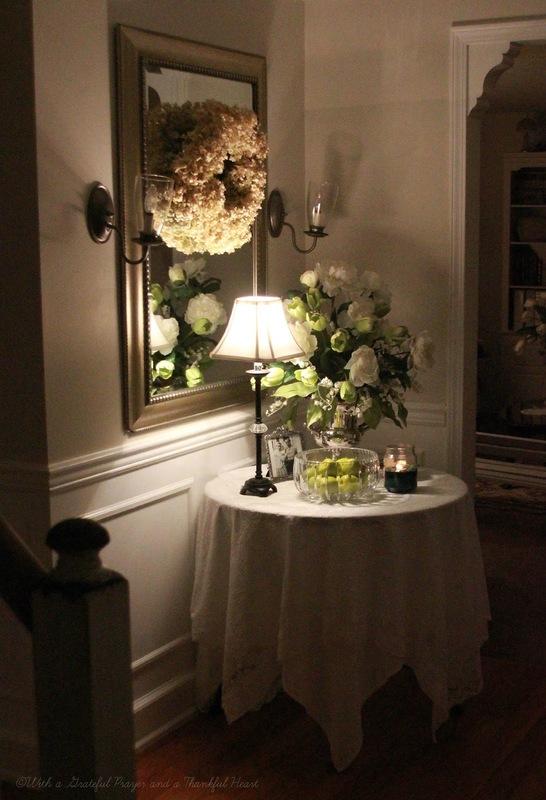 We have lots going on right now but last night I did a small foyer change. 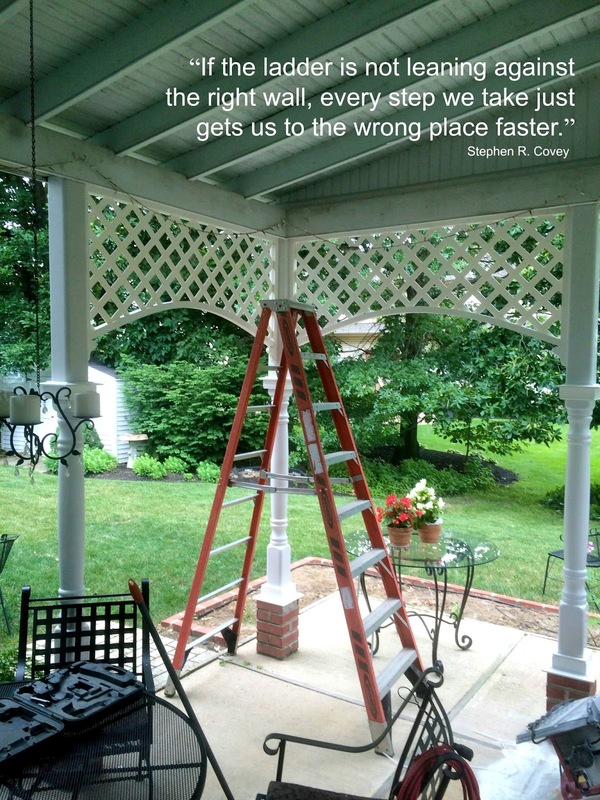 It was an impromptu change brought about as we are readying the patio for winter. I like the change for now. John’s 96 year old Aunt Marie passed away yesterday. We have been visiting with her in the hospital making the hour drive each way for the past couple of weeks. Aunt Marie never had children. 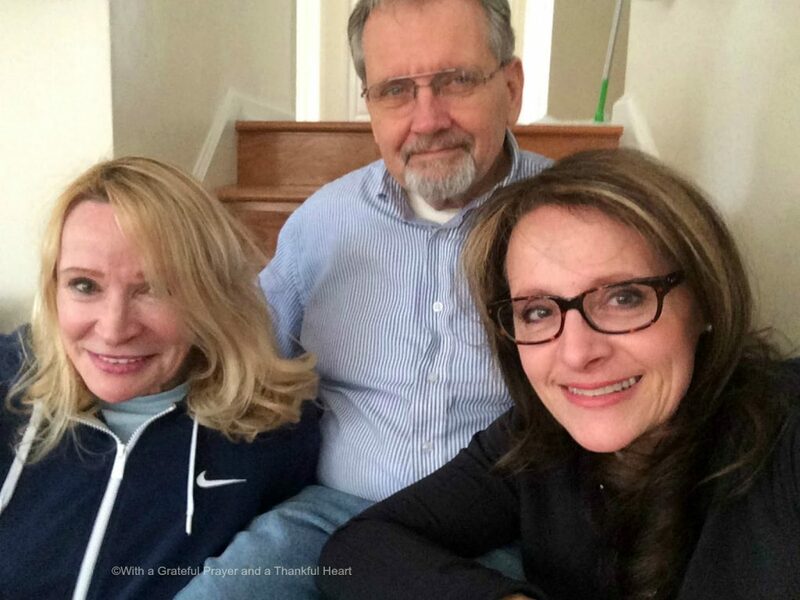 She has one niece who lives in Indiana, John and his brother. We will all be making funeral arrangements and working together to liquidate her home. Our Jamie is scheduled to have her baby tomorrow! Life can get so full and this is one of those times. I’ve got another wreath idea to share with you. 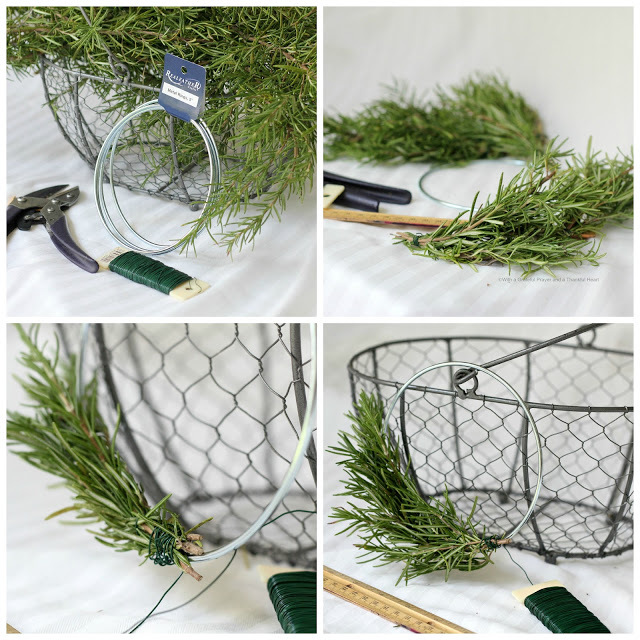 A wreath made of Rosemary sprigs is both aromatic and handy to snip and add in meal preparation. For the base of the wreath I looked for a small circle. I found a package of four, five-inch metal circles in the leather supply section of the craft store.You could use a heavy wire and make the circle yourself. After cutting the rosemary into 5-6-inch pieces, I wired several of them into a bundle. It took six bundles to go around and fill out this 5-inch wire circle. My Rosemary was a windowsill-size gift from a friend. I kept it indoors for a year and then planted it outside in a pot. It grew and I transplanted it into a raised bed herb garden two years ago. Rosemary is an aromatic, perennial herb with fragrant, evergreen, needle-like leaves. The leaves are used as a flavoring in foods such as stuffing, pork, chicken and turkey. It is native to the Mediterranean region. 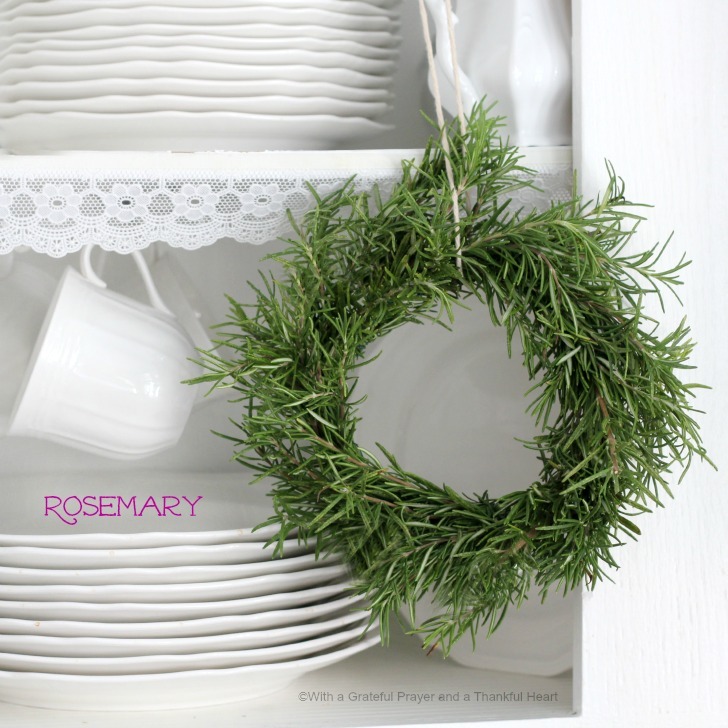 The name “rosemary” derives from the Latin for “dew” (ros) and “sea” (marinus), or “dew of the sea”. 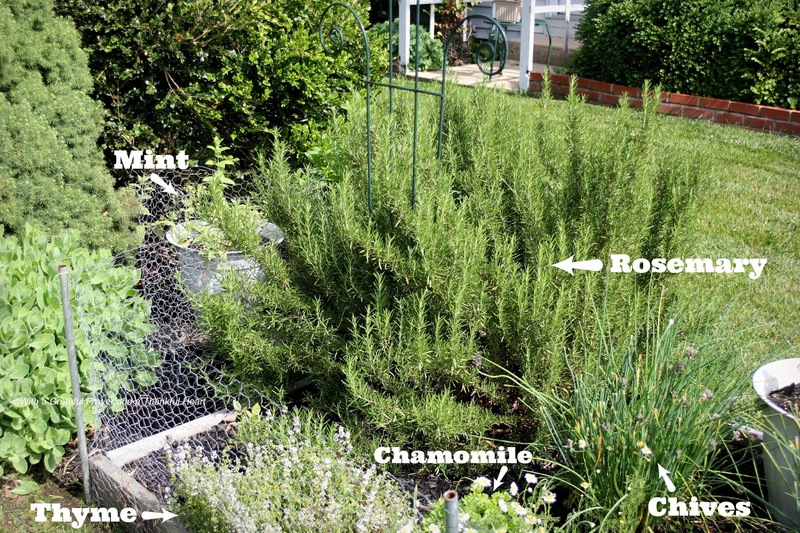 Rosemary is reasonably hardy in cool climates and it can withstand droughts. I live in zone 6b and my rosemary has no problem wintering over. 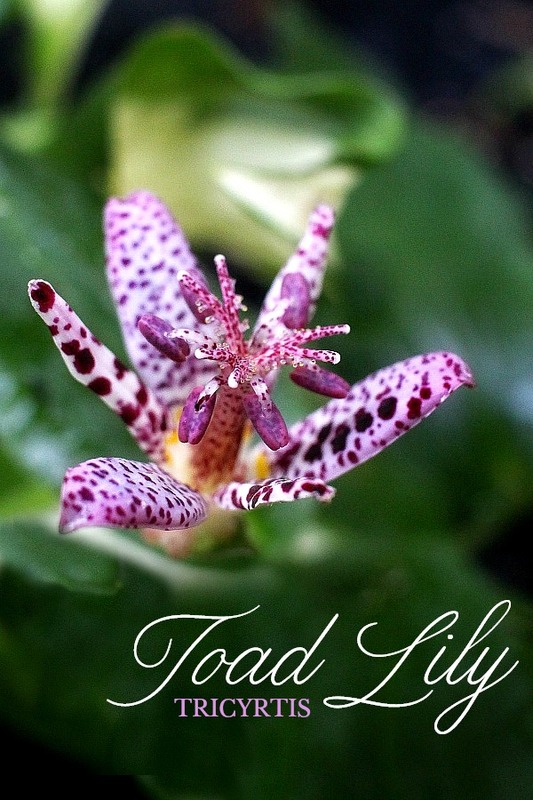 It is easy to grow and pest-resistant and can be grown in pots. Be sure it has good drainage and a sunny location. Whisk the egg in a pie plate to blend. 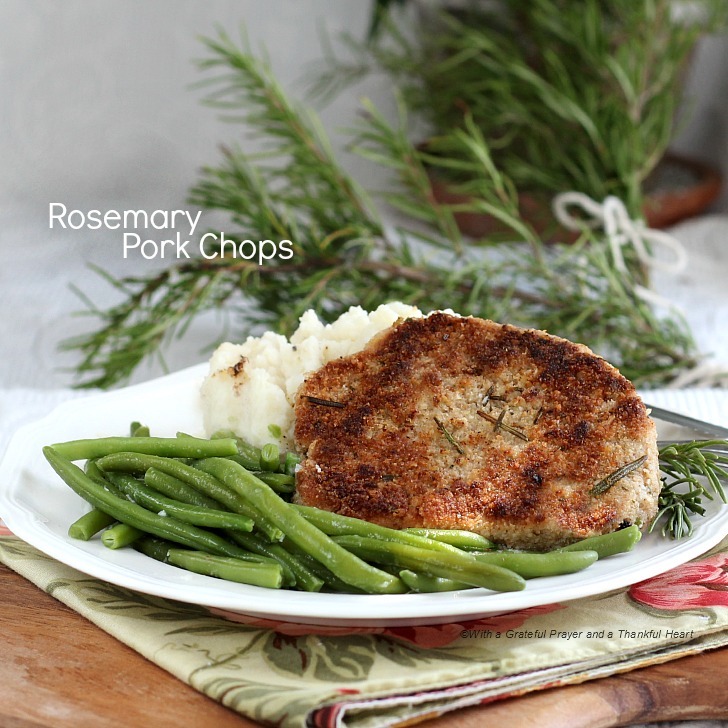 Combine Parmesan cheese, bread crumbs and the rosemary in another plate. Sprinkle the pork chops with salt and pepper. Dip the pork chops in the egg and then into the cheese/bread crumb mixture, coating completely, patting to adhere. Heat 1-2 tablespoons of oil in a large skillet over medium heat. Add pork chops, and cook until golden brown and the center reaches 150 degrees, about 6 minutes per side. Add additional oil as needed when cooking second side. 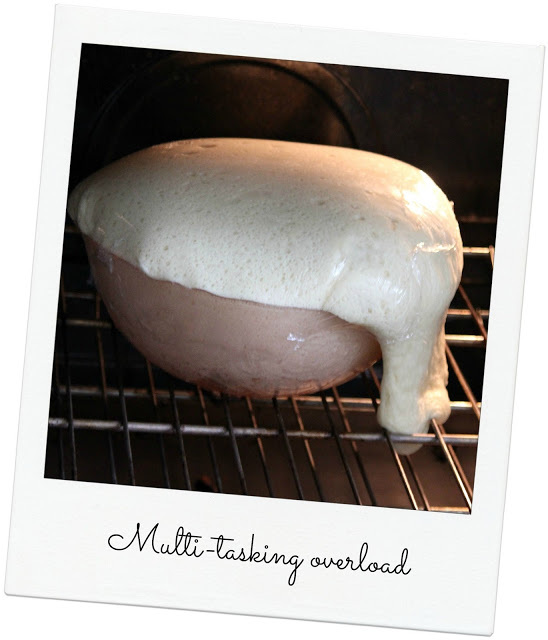 (My chops browned quickly, so I covered pan with lid, leaving slightly ajar and cooked for less time until just cooked through keeping them nice and juicy). I served with mashed potatoes and fresh green beans. Saturday was cloudy, drizzly, humid and messy. 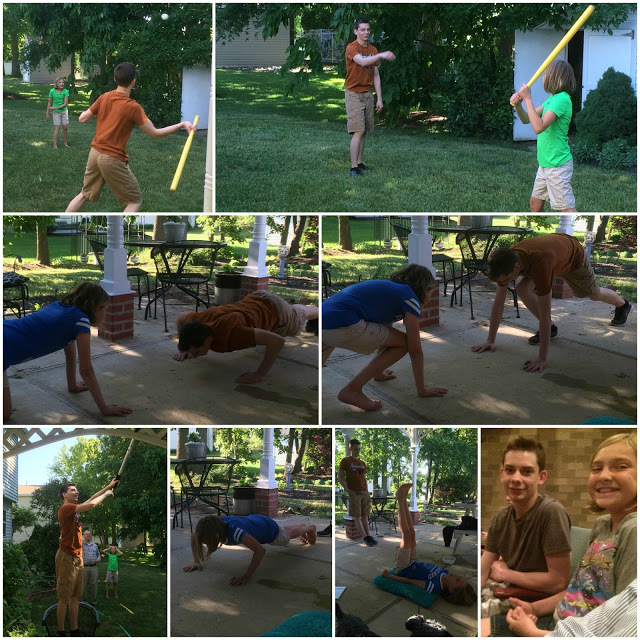 But it didn’t stop us from putting in a long and tiring day of yard work. 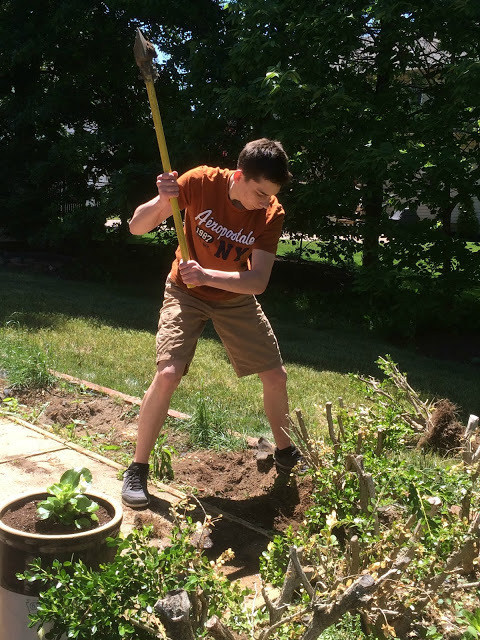 Trying to catch up on all of those muscle and bone-wearying chores that come with yard care. 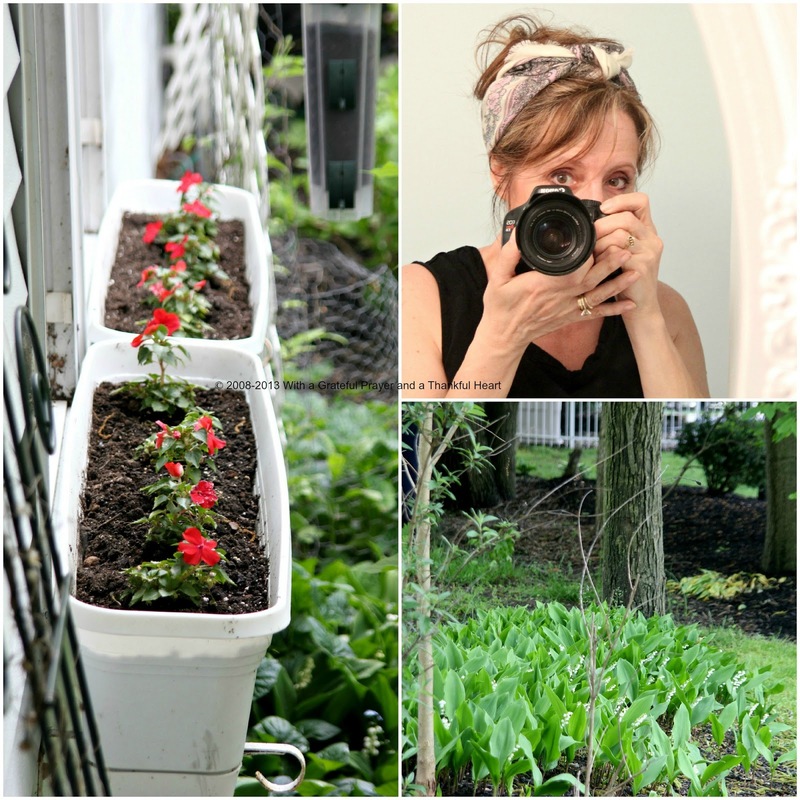 window boxes filled by a sweaty, disheveled, camera-toting nut that had to change from early morning sweatshirt to sleeveless shirt as the day and hard work progressed. 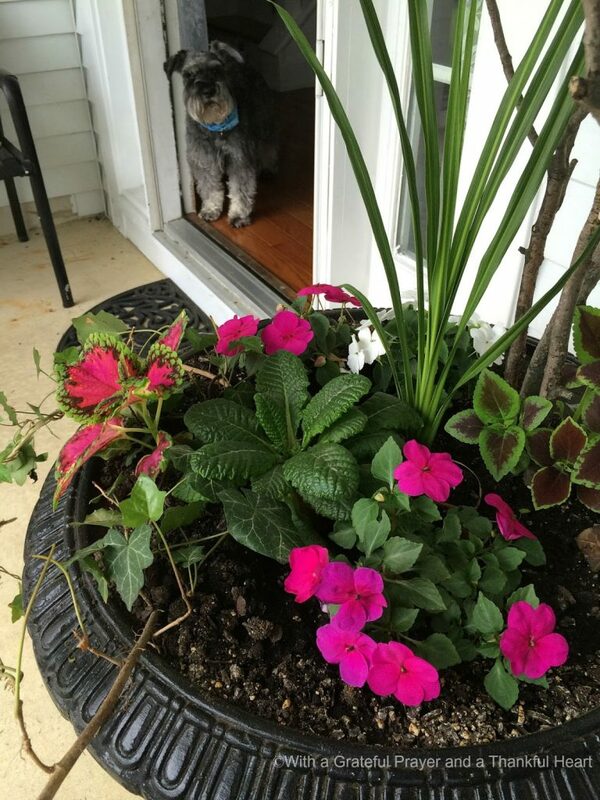 flower container returned to front door after cleaning and disinfecting from brood of birds that took up residence for several weeks. Last spring, our township removed a large tree from the curb edge that had been in decline for several years. In the fall, they took out most of the stump leaving a large mound of wood chips. 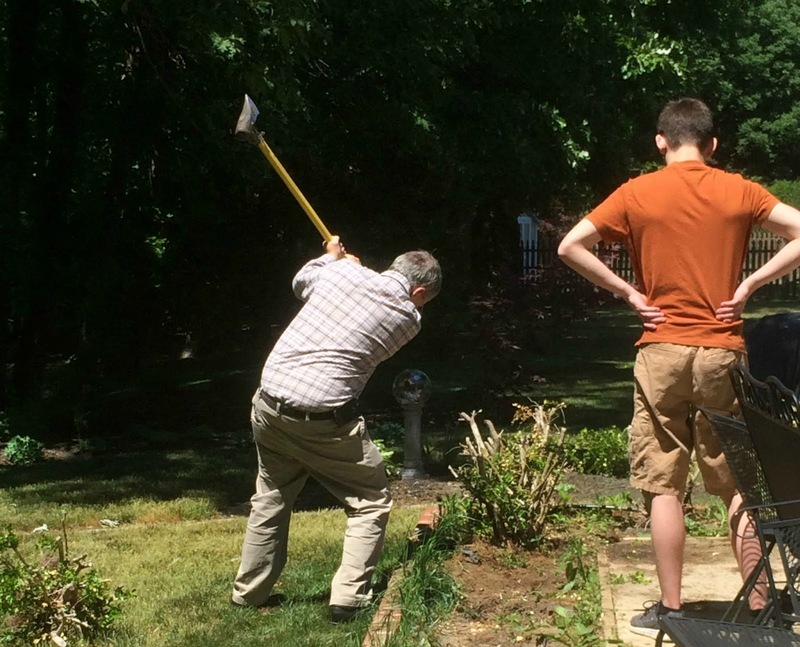 John used a hatchet to get more of the stump out and then leveled the surface. 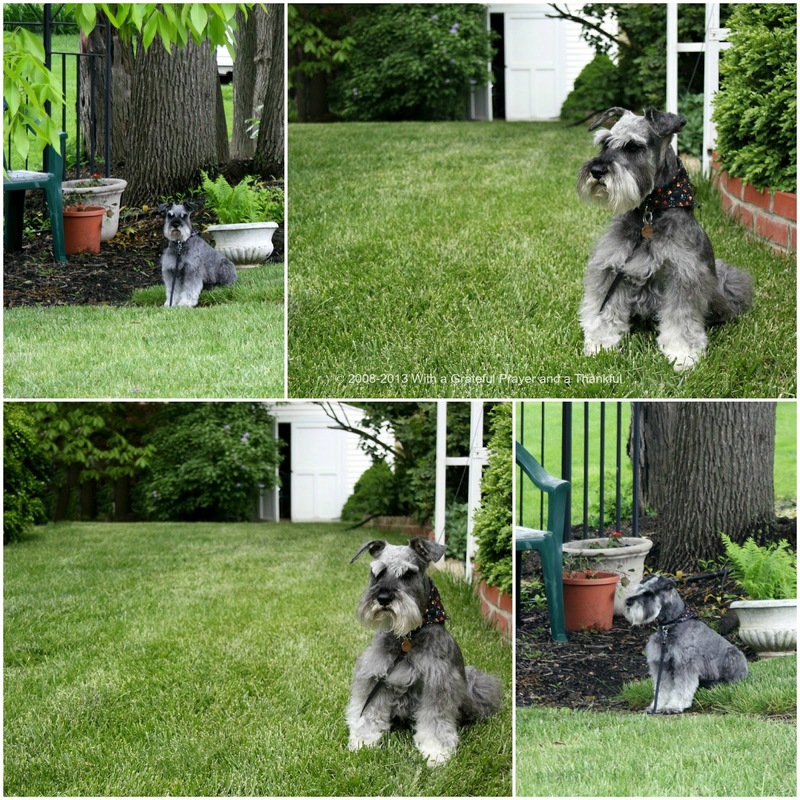 Instead of planting grass seed, he bought sod and we got it down this week. 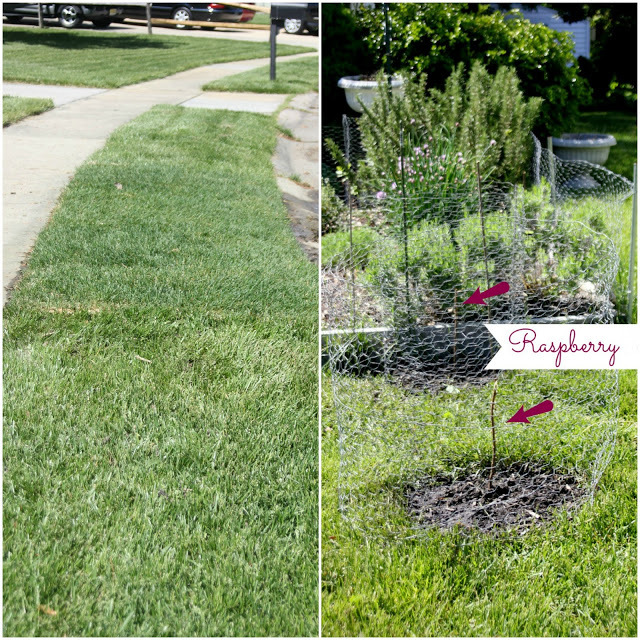 We also planted a few more raspberry and blackberry bushes. mulch ordered for Saturday delivery. 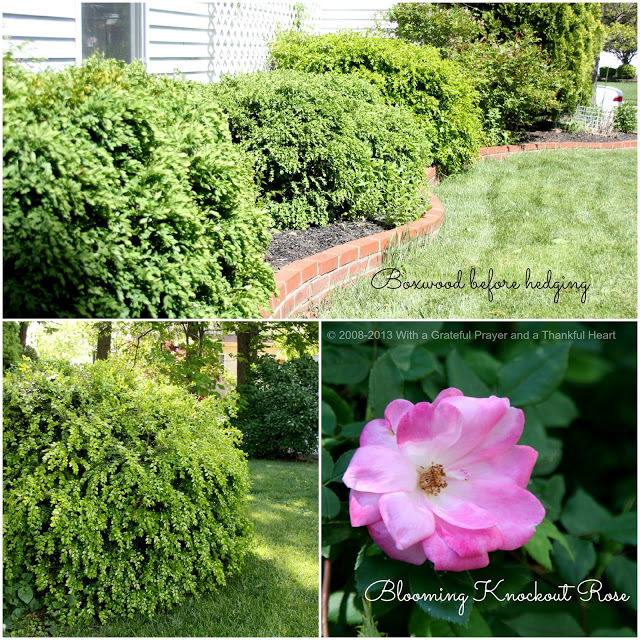 bushes and boxwood still need hedging. but that was enough for one day. 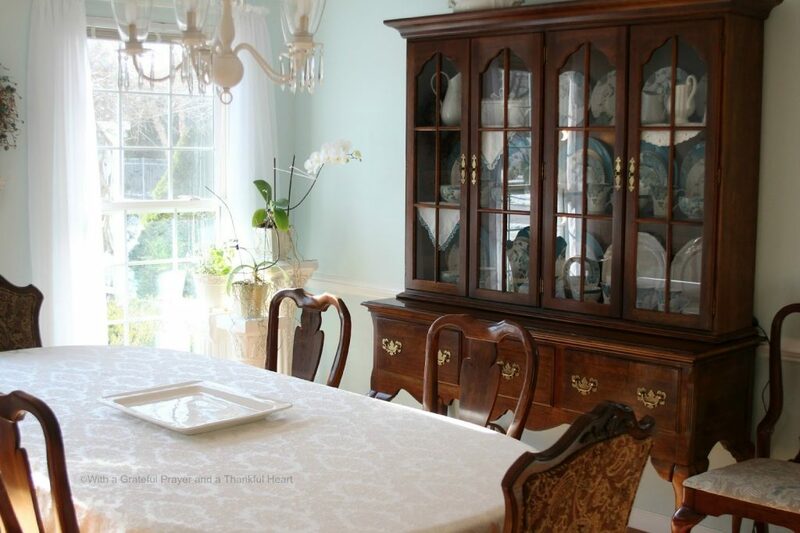 Joining Kathleen @Cuisine Kathleen for her Let’s Dish Tablescape Party with the theme challenge of birds, bees. 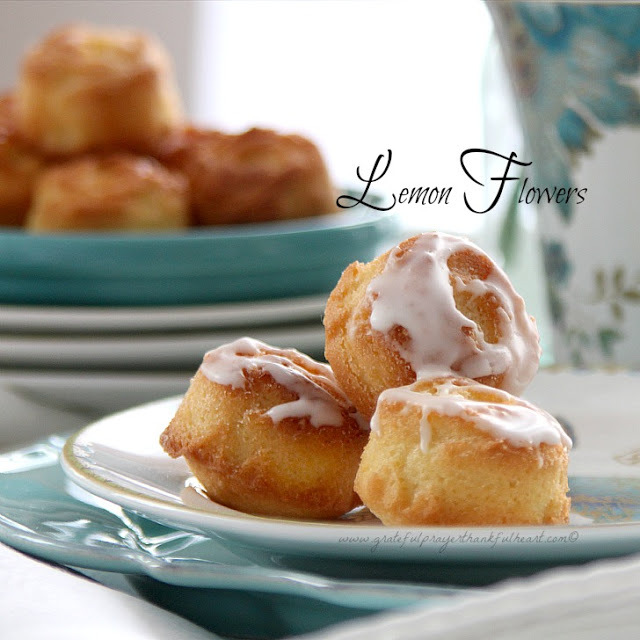 flowers, trees and sharing a recipe for lemon flower teacakes.